This paper, known as the Observing Scenarios Document with the Collaboration, outlines the observing plans of the ground-based detectors over the coming decade. If you want to search for electromagnetic or neutrino signals from our gravitational-wave sources, this is the paper for you. It is a living review—a document that is continuously updated. As you might imagine, these are quite significant updates! The first showed that we can do gravitational-wave astronomy. The second showed that we can do exactly the science this paper is about. The third makes this the first joint publication of the LIGO Scientific, Virgo and KAGRA Collaborations—hopefully the first of many to come. I lead both this and the previous version. In my blog on the previous version, I explained how I got involved, and the long road that a collaboration must follow to get published. In this post, I’ll give an overview of the key details from the new version together with some behind-the-scenes background (working as part of a large scientific collaboration allows you to do amazing science, but it can also be exhausting). 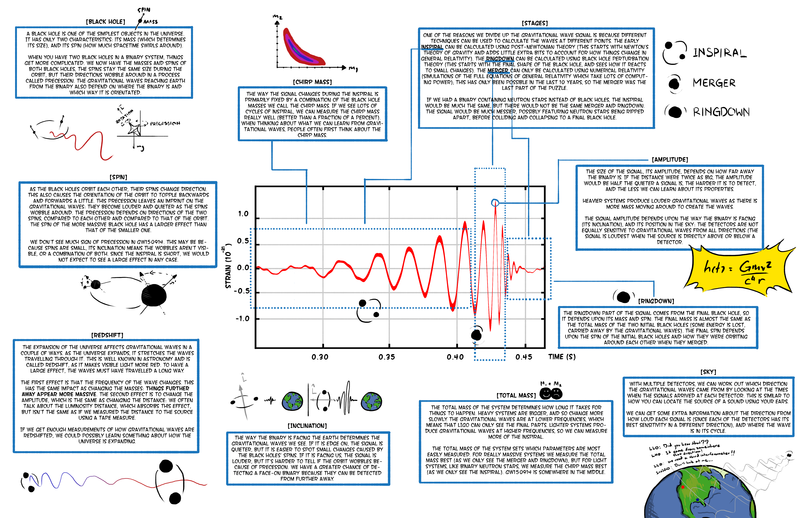 If you’d like a digest of this paper’s science, check out the LIGO science summary. The first section of the paper outlines the progression of detector sensitivities. The instruments are incredibly sensitive—we’ve never made machines to make these types of measurements before, so it takes a lot of work to get them to run smoothly. We can’t just switch them on and have them work at design sensitivity [bonus note]. 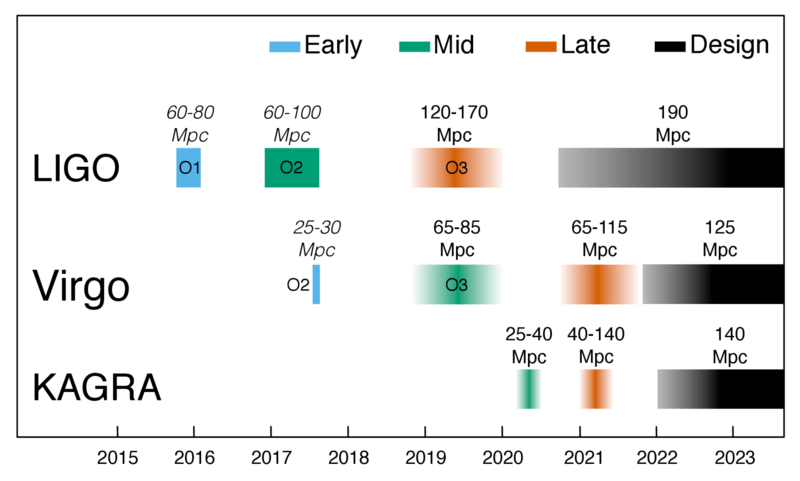 Target evolution of the Advanced LIGO and Advanced Virgo detectors with time. The lower the sensitivity curve, the further away we can detect sources. The distances quoted are binary neutron star (BNS) ranges, the average distance we could detect a binary neutron star system. 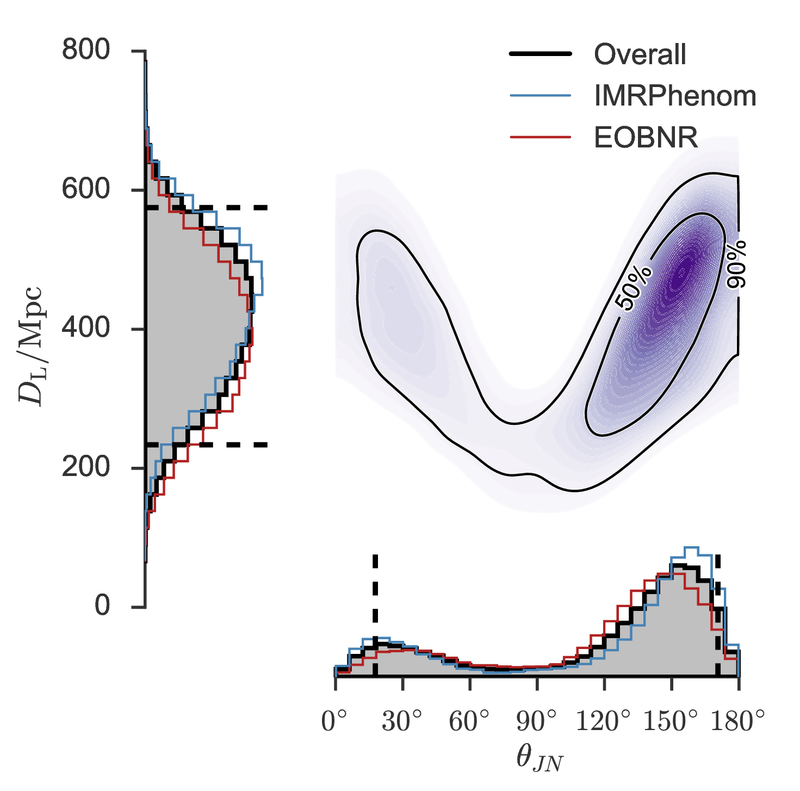 The BNS-optimized curve is a proposal to tweak the detectors for finding BNSs. Figure 1 of the Observing Scenarios Document. The plots above show the planned progression of the different detectors. We had to get these agreed before we could write the later parts of the paper because the sensitivity of the detectors determines how many sources we will see and how well we will be able to localize them. I had anticipated that KAGRA would be the most challenging here, as we had not previously put together this sequence of curves. However, this was not the case, instead it was Virgo which was tricky. They had a problem with the silica fibres which suspended their mirrors (they snapped, which is definitely not what you want). The silica fibres were replaced with steel ones, but it wasn’t immediately clear what sensitivity they’d achieve and when. The final word was they’d observe in August 2017 and that their projections were unchanged. I was sceptical, but they did pull it out of the bag! We had our first clear three-detector observation of a gravitational wave 14 August 2017. Bravo Virgo! Plausible time line of observing runs with Advanced LIGO (Hanford and Livingston), advanced Virgo and KAGRA. It is too early to give a timeline for LIGO India. The numbers above the bars give binary neutron star ranges (italic for achieved, roman for target); the colours match those in the plot above. 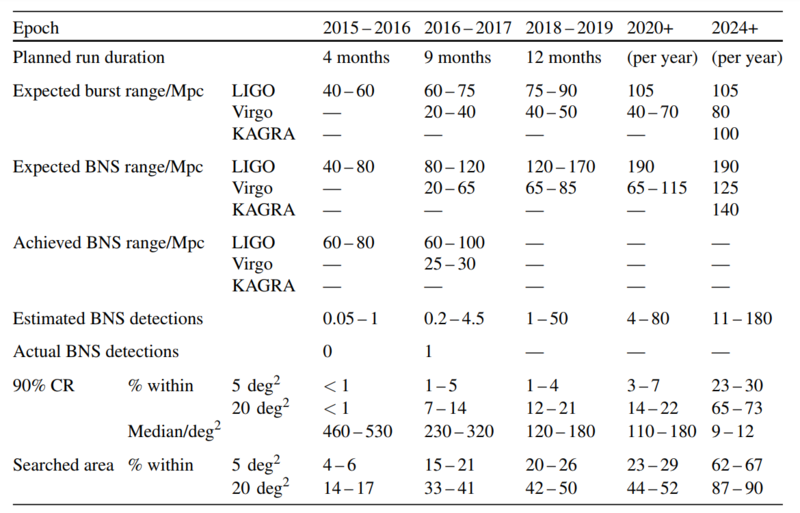 Currently our third observing run (O3) looks like it will start in early 2019; KAGRA might join with an early sensitivity run at the end of it. Figure 2 of the Observing Scenarios Document. The second section explain our data analysis techniques: how we find signals in the data, how we work out probable source locations, and how we communicate these results with the broader astronomical community—from the start of our third observing run (O3), information will be shared publicly! The information in this section hasn’t changed much [bonus note]. There is a nice collection of references on the follow-up of different events, including GW170817 (I’d recommend my blog for more on the electromagnetic story). The main update I wanted to include was information on the detection of our first gravitational waves. It turned out to be more difficult than I imagined to come up with a plot which showed results from the five different search algorithms (two which used templates, and three which did not) which found GW150914, and harder still to make a plot which everyone liked. This plot become somewhat infamous for the amount of discussion it generated. I think we ended up with something which was a good compromise and clearly shows our detections sticking out above the background of noise. Offline transient search results from our first observing run (O1). The plot shows the number of events found verses false alarm rate: if there were no gravitational waves we would expect the points to follow the dashed line. The left panel shows the results of the templated search for compact binary coalescences (binary black holes, binary neutron stars and neutron star–black hole binaries), the right panel shows the unmodelled burst search. GW150914, GW151226 and LVT151012 are found by the templated search; GW150914 is also seen in the burst search. Arrows indicate bounds on the significance. Figure 3 of the Observing Scenarios Document. The third section brings everything together and looks at what the prospects are for (gravitational-wave) multimessenger astronomy during each observing run. It’s really all about the big table. Summary of different observing scenarios with the advanced detectors. We assume a 70–75% duty factor for each instrument (including Virgo for the second scenario’s sky localization, even though it only joined our second observing run for the final month). Table 3 from the Observing Scenarios Document. Actual binary neutron stars detected = 1. We did it! With the five detector network the sky localization is really good. The median localization is about 9–12 square degrees, about the area the LSST could cover in a single pointing! This really shows the benefit of adding more detector to the network. The improvement comes not because a source is much better localized with five detectors than four, but because when you have five detectors you almost always have at least three detectors(the number needed to get a good triangulation) online at any moment, so you get a nice localization for pretty much everything. In summary, the prospects for observing and localizing gravitational-wave transients are pretty great. If you are an astronomer, make the most of the quiet before O3 begins next year. Prospects for the next update: After two updates, I’ve stepped down from preparing the next one. Wooh! The announcement of our first multimessenger detection came between us submitting this update and us getting referee reports. We wanted an updated version of this paper, with the current details of our observing plans, to be available for our astronomer partners to be able to cite when writing their papers on GW170817. Predictably, when the referee reports came back, we were told we really should include reference to GW170817. This type of discovery is exactly what this paper is about! There was avalanche of results surrounding GW170817, so I had to read through a lot of papers. The reference list swelled from 8 to 13 pages, but this effort was handy for my blog writing. After including all these new results, it really felt like this was version 2.5 of the Observing Scenarios, rather than version 2. We use the term design sensitivity to indicate the performance the current detectors were designed to achieve. They are the targets we aim to achieve with Advanced LIGO, Advance Virgo and KAGRA. One thing I’ve had to try to train myself not to say is that design sensitivity is the final sensitivity of our detectors. Teams are currently working on plans for how we can upgrade our detectors beyond design sensitivity. Reaching design sensitivity will not be the end of our journey. Our first gravitational-wave detections were from binary black holes. Therefore, when we were starting on this update there was a push to switch from focusing on binary neutron stars to binary black holes. I resisted on this, partially because I’m lazy, but mostly because I still thought that binary neutron stars were our best bet for multimessenger astronomy. This worked out nicely. It’s now about 7 weeks since the announcement, and the madness is starting to subside. Although, that doesn’t mean things aren’t busy—we’re now enjoying completely new forms of craziness. 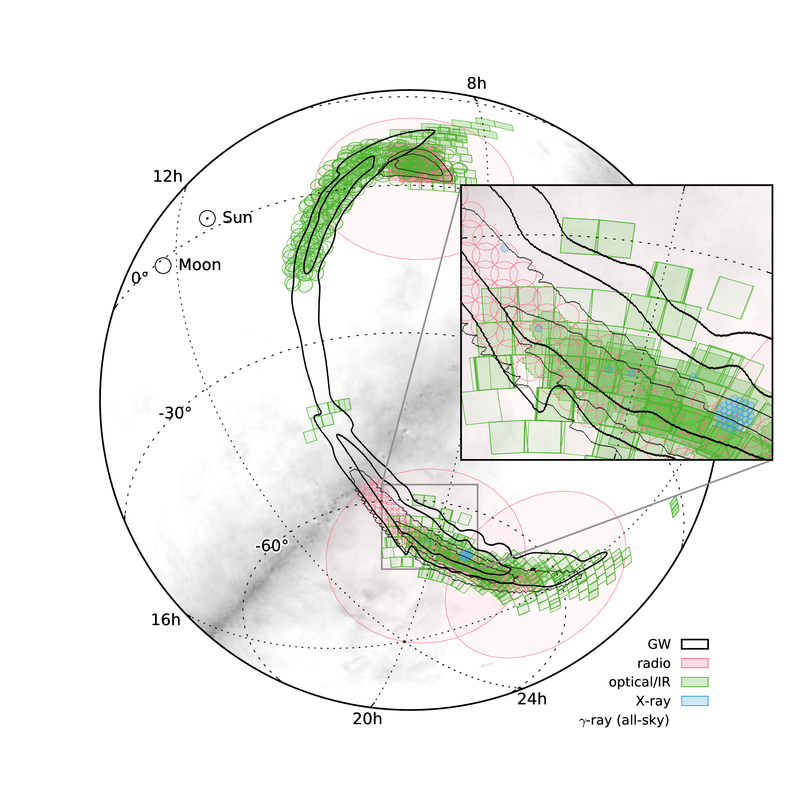 In mid March we had our LIGO–Virgo Collaboration Meeting. This was part celebration, part talking about finishing our O1 analysis and part thinking ahead to O2, which is shockingly close. It was fun, there was cake. 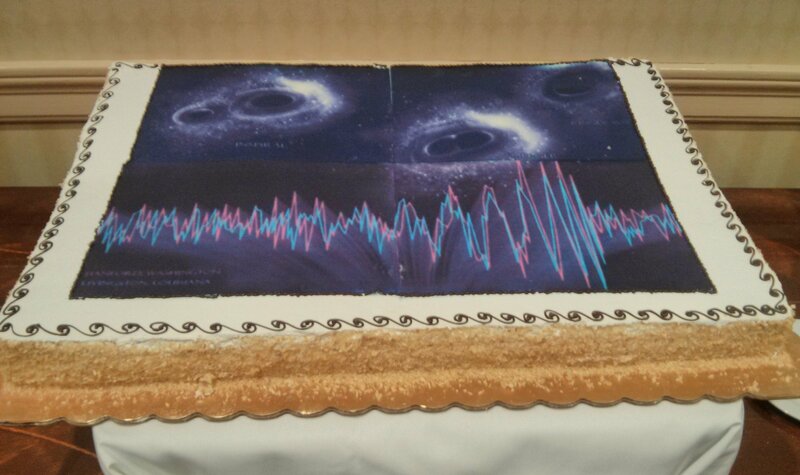 Celebratory cake from the March LIGO–Virgo Meeting. It was delicious and had a fruity (strawberry?) filling. The image is February 11th’s Astronomy Picture of the Day. There was a second cake without a picture, that was equally delicious, but the queue was shorter. All the business means that I’ve fallen behind with my posts, and I’ve rather neglected the final paper published the week starting 8 February. This is perhaps rather apt as this paper has the misfortune to be the first non-detection published in the post-detection world. It is also about a neglected class of signals. Compact binary coalescences (like two merging black holes), for which we have templates for the signal. High mass systems might only last a fraction of a second within the detector’s frequency range, but low mass systems could last for a minute (which is a huge pain for us to analyse). 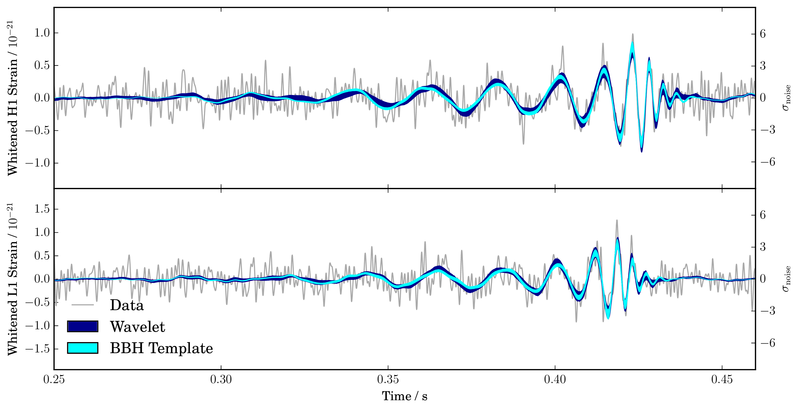 Continuous waves from rotating neutron stars which are almost constant throughout our observations. Bursts, which are transient signals where we don’t have a good model. The classic burst source is from a supernova explosion. We have some effective search pipelines for finding short bursts—signals of about a second or less. Coherent Waveburst, which was the first code to spot GW150914 is perhaps the best known example. 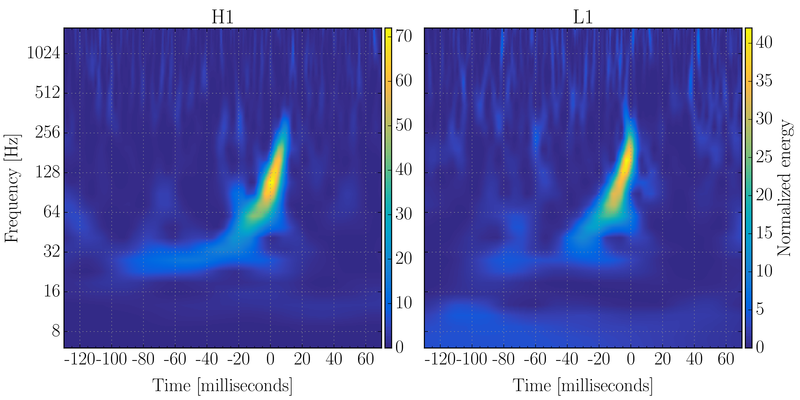 This paper looks at finding longer burst signals, a few seconds to a few hundred seconds in length. There aren’t too many well studied models for these long bursts. Most of the potential sources are related to the collapse of massive stars. There can be a large amount of matter moving around quickly in these situations, which is what you want for gravitational waves. Massive stars may end their life in a core collapse supernova. Having used up its nuclear fuel, the star no longer has the energy to keep itself fluffy, and its core collapses under its own gravity. The collapse leads to an explosion as material condenses to form a neutron star, blasting off the outer layers of the star. Gravitational waves could be generated by the sloshing of the outer layers as some is shot outwards and some falls back, hitting the surface of the new neutron star. The new neutron star itself will start life puffed up and perhaps rapidly spinning, and can generate gravitational waves at it settles down to a stable state—a similar thing could happen if an older neutron star is disturbed by a glitch (where we think the crust readjusts itself in something like an earthquake, but more cataclysmic), or if a neutron star accretes a large blob of material. For the most massive stars, the core continues to collapse through being a neutron star to become a black hole. The collapse would just produce a short burst, so it’s not what we’re looking for here. However, once we have a black hole, we might build a disc out of material swirling into the black hole (perhaps remnants of the outer parts of the star, or maybe from a companion star). The disc may be clumpy, perhaps because of eddies or magnetic fields (the usual suspects when astrophysicists don’t know exactly what’s going on), and they rapidly inspiralling blobs could emit a gravitational wave signal. The potential sources don’t involve as much mass as a compact binary coalescence, so these signals wouldn’t be as loud. Therefore we couldn’t see them quite as far way, but they could give us some insight into these messy processes. 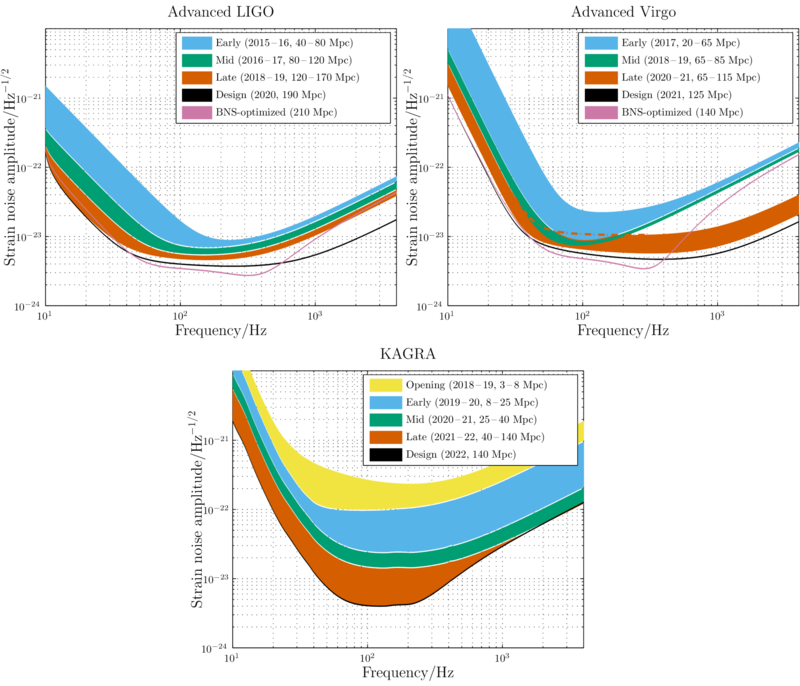 The paper looks at results using old LIGO data from the fifth and sixth science runs (S5 and S6). Virgo was running at this time, but the data wasn’t included as it vastly increases the computational cost while only increasing the search sensitivity by a few percent (although it would have helped with locating a source if there were one). The data is analysed with the Stochastic Transient Analysis Multi-detector Pipeline (STAMP); we’ll be doing a similar thing with O1 data too. 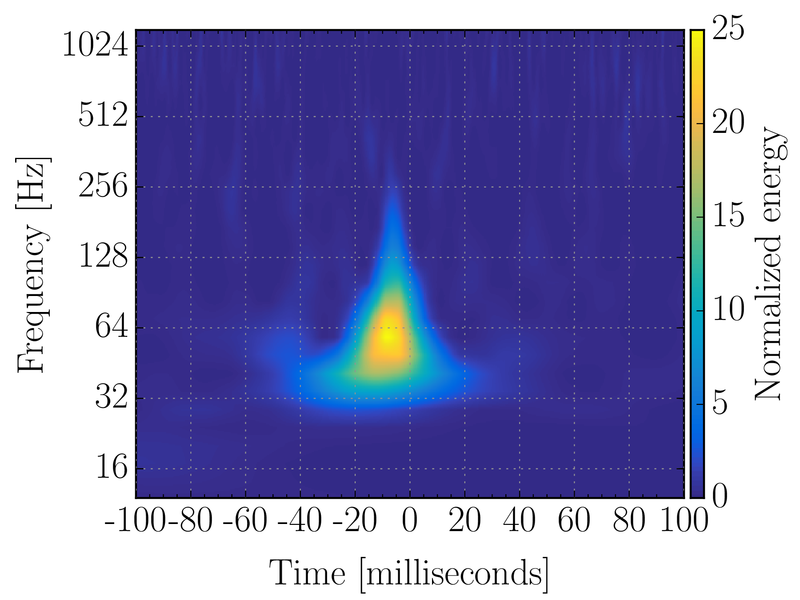 STAMP searches for signals by building a spectrogram: a plot of how much power there is at a particular gravitational wave frequency at a particular time. If there is just noise, you wouldn’t expect the power at one frequency and time to be correlated with that at another frequency and time. Therefore, the search looks for clusters, grouping together times or frequencies closer to one another where there is more power then you might expect. The analysis is cunning, as it coherently analysis data from both detectors together when constructing the spectrogram, folding in the extra distance a gravitational wave must travel between the detectors for a given sky position. The significance of events is calculated is a similar way to how we search for binary black holes. The pipeline ranks candidates using a detection statistic, a signal-to-noise ratio for the cluster of interesting time–frequency pixels (something like the amount of power measured divided by the amount you’d expect randomly). We work out how frequently you’d expect a particular value of by analysing time-shifted data: where we’ve shifted the data from one of the detectors in time relative to data from the other so that we know there can’t be the same signal found in both. The distribution of is shown below from the search (dots) and from the noise background (lines). You can see that things are entirely consistent with our expectations for just noise. The most significant event has a false alarm probability of 54%, so you’re better off betting it’s just noise. There are no detections here. signal-to-noise ratio. 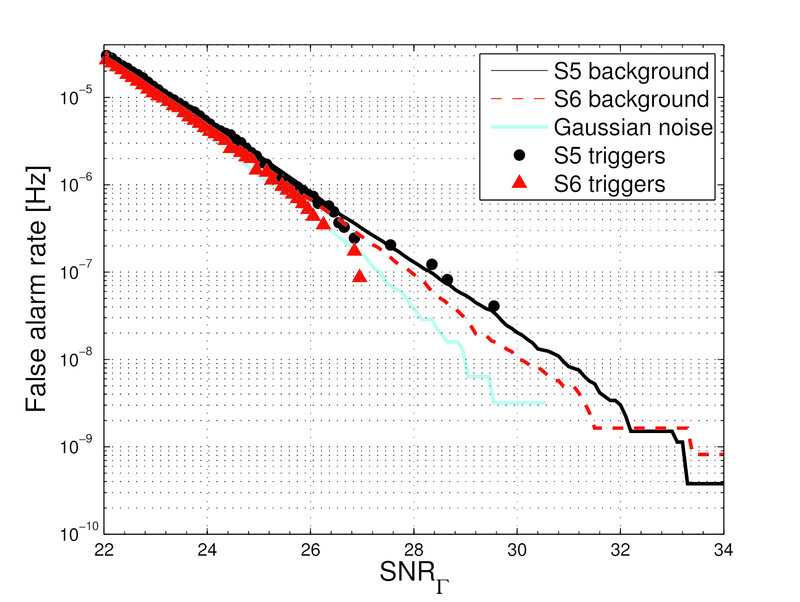 The background S5 and S6 noise distributions are shown by the solid black and dashed red lines respectively. An idealised Gaussian noise background is shown in cyan. There are no triggers significantly above the expected background level. Fig. 5 from Abbott et al. (2016). Since the detectors are now much more sensitive, perhaps there’s something lurking in our new data. I still think this in unlikely since we can’t see sources from a significant distance, but I guess we’ll have to wait for the results of the analysis. 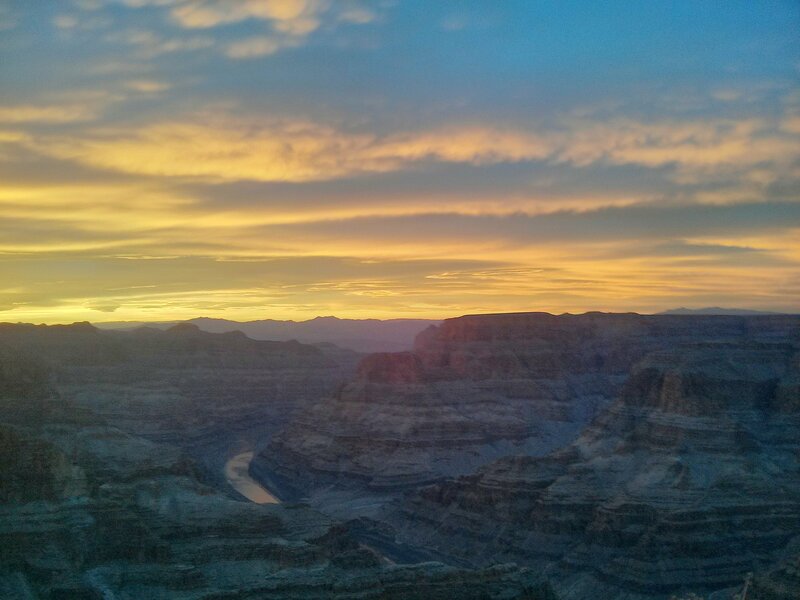 Sunset over the Grand Canyon. One of the perks of academia is the travel. A group of us from Birmingham went on a small adventure after the LIGO–Virgo Meeting. This is another reason why I’ve not been updating my blog. In 2015 I made a resolution to write a blog post for each paper I had published. In 2016 I’ll have to break this because there are too many to keep up with. A suite of papers were prepared to accompany the announcement of the detection of GW150914 [bonus note], and in this post I’ll give an overview of these. As well as the Discovery Paper published in Physical Review Letters [bonus note], there are 12 companion papers. All the papers are listed below in order of arXiv posting. My favourite is the Parameter Estimation Paper. Subsequently, we have produced additional papers on GW150914, describing work that wasn’t finished in time for the announcement. The most up-to-date results are currently give nin the O2 Catalogue Paper. This is the central paper that announces the observation of gravitational waves. There are three discoveries which are describe here: (i) the direct detection of gravitational waves, (ii) the existence of stellar-mass binary black holes, and (iii) that the black holes and gravitational waves are consistent with Einstein’s theory of general relativity. That’s not too shabby in under 11 pages (if you exclude the author list). Coming 100 years after Einstein first published his prediction of gravitational waves and Schwarzschild published his black hole solution, this is the perfect birthday present. This paper gives a short summary of how the LIGO detectors work and their configuration in O1 (see the Advanced LIGO paper for the full design). Giant lasers and tiny measurements, the experimentalists do some cool things (even if their paper titles are a little cheesy and they seem to be allergic to error bars). Here we explain how we search for binary black holes and calculate the significance of potential candidates. This is the evidence to back up (i) in the Discovery Paper. We can potentially detect binary black holes in two ways: with searches that use templates, or with searches that look for coherent signals in both detectors without assuming a particular shape. The first type is also used for neutron star–black hole or binary neutron star coalescences, collectively known as compact binary coalescences. This type of search is described here, while the other type is described in the Burst Paper. This paper describes the compact binary coalescence search pipelines and their results. As well as GW150914 there is also another interesting event, LVT151012. This isn’t significant enough to be claimed as a detection, but it is worth considering in more detail. If you’re interested in the properties of the binary black hole system, then this is the paper for you! Here we explain how we do parameter estimation and how it is possible to extract masses, spins, location, etc. from the signal. These are the results I’ve been most heavily involved with, so I hope lots of people will find them useful! This is the paper to cite if you’re using our best masses, spins, distance or sky maps. The masses we infer are so large we conclude that the system must contain black holes, which is discovery (ii) reported in the Discovery Paper. LIGO science summary: Was Einstein right about strong gravity? The observation of GW150914 provides a new insight into the behaviour of gravity. We have never before probed such strong gravitational fields or such highly dynamical spacetime. These are the sorts of places you might imagine that we could start to see deviations from the predictions of general relativity. Aside from checking that we understand gravity, we also need to check to see if there is any evidence that our estimated parameters for the system could be off. We find that everything is consistent with general relativity, which is good for Einstein and is also discovery (iii) in the Discovery Paper. Given that we’ve spotted one binary black hole (plus maybe another with LVT151012), how many more are out there and how many more should we expect to find? We answer this here, although there’s a large uncertainty on the estimates since we don’t know (yet) the distribution of masses for binary black holes. What can you learn about GW150914 without having to make the assumptions that it corresponds to gravitational waves from a binary black hole merger (as predicted by general relativity)? This paper describes and presents the results of the burst searches. Since the pipeline which first found GW150914 was a burst pipeline, it seems a little unfair that this paper comes after the Compact Binary Coalescence Paper, but I guess the idea is to first present results assuming it is a binary (since these are tightest) and then see how things change if you relax the assumptions. The waveforms reconstructed by the burst models do match the templates for a binary black hole coalescence. Could GW150914 be caused by something other than a gravitational wave: are there sources of noise that could mimic a signal, or ways that the detector could be disturbed to produce something that would be mistaken for a detection? This paper looks at these problems and details all the ways we monitor the detectors and the external environment. We can find nothing that can explain GW150914 (and LVT151012) other than either a gravitational wave or a really lucky random noise fluctuation. I think this paper is extremely important to our ability to claim a detection and I’m surprised it’s not number 2 in the list of companion papers. If you want to know how thorough the Collaboration is in monitoring the detectors, this is the paper for you. Completing the triumvirate of instrumental papers with the Detector Paper and the Detector Characterisation Paper, this paper describes how the LIGO detectors are calibrated. 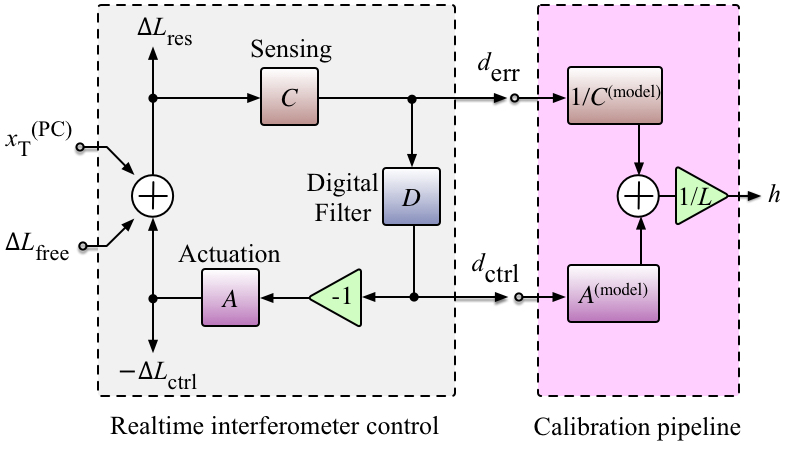 There are some cunning control mechanisms involved in operating the interferometers, and we need to understand these to quantify how they effect what we measure. Building a better model for calibration uncertainties is high on the to-do list for improving parameter estimation, so this is an interesting area to watch for me. Having estimated source parameters and rate of mergers, what can we say about astrophysics? 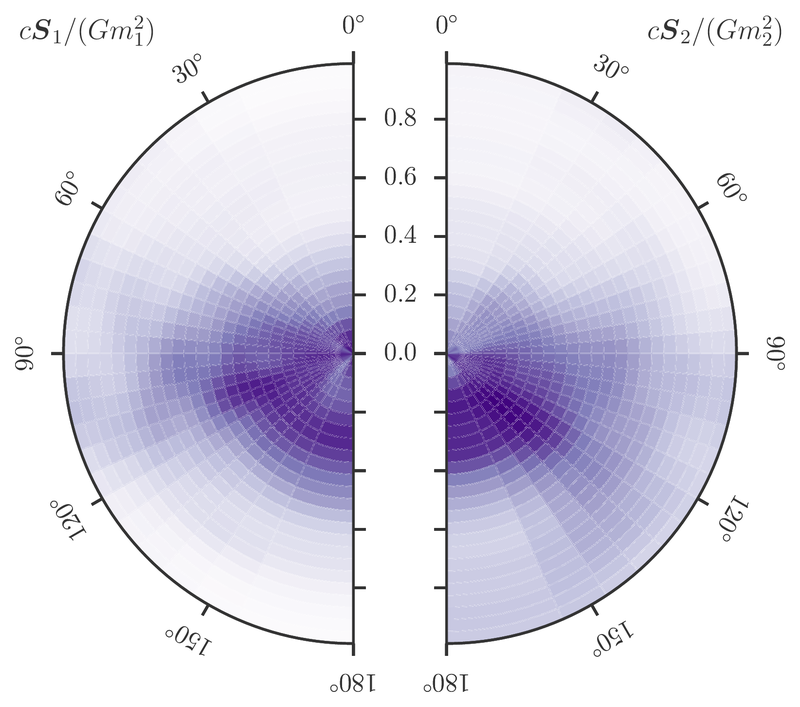 This paper reviews results related to binary black holes to put our findings in context and also makes statements about what we could hope to learn in the future. For every loud signal we detect, we expect that there will be many more quiet ones. This paper considers how many quiet binary black hole signals could add up to form a stochastic background. We may be able to see this background as the detectors are upgraded, so we should start thinking about what to do to identify it and learn from it. We are interested so see if there’s any other signal that coincides with a gravitational wave signal. 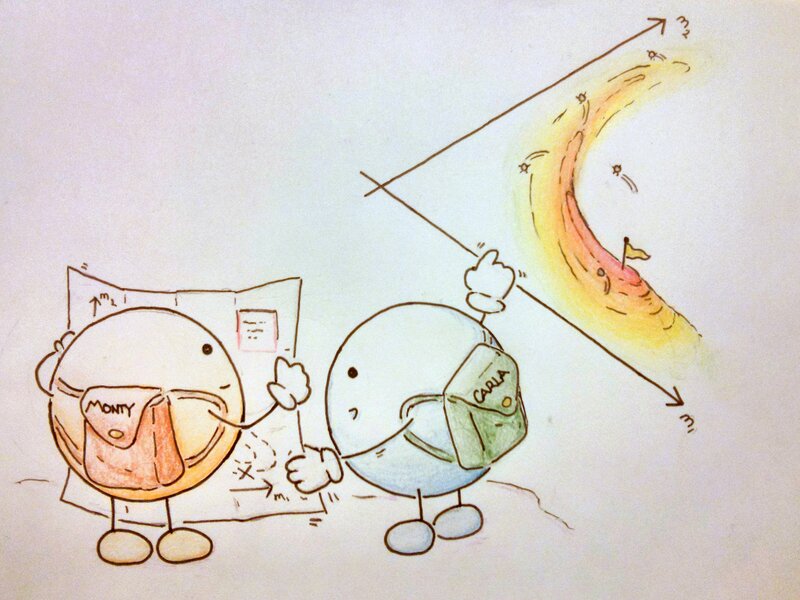 We wouldn’t expect something to accompany a black hole merger, but it’s good to check. This paper describes the search for high-energy neutrinos. We didn’t find anything, but perhaps we will in the future (perhaps for a binary neutron star merger). As well as looking for coincident neutrinos, we are also interested in electromagnetic observations (gamma-ray, X-ray, optical, infra-red or radio). We had a large group of observers interesting in following up on gravitational wave triggers, and 25 teams have reported observations. This companion describes the procedure for follow-up observations and discusses sky localisation. This work split into a main article and a supplement which goes into more technical details. The Discovery Paper gives the key science results and is remarkably well written. It seems a shame to summarise it: you should read it for yourself! (It’s free). The LIGO detectors contain lots of cool pieces of physics. This paper briefly outlines them all: the mirror suspensions, the vacuum (the LIGO arms are the largest vacuum envelopes in the world and some of the cleanest), the mirror coatings, the laser optics and the control systems. A full description is given in the Advanced LIGO paper, but the specs there are for design sensitivity (it is also heavy reading). The main difference between the current configuration and that for design sensitivity is the laser power. Currently the circulating power in the arms is , the plan is to go up to . This will reduce shot noise, but raises all sorts of control issues, such as how to avoid parametric instabilities. The noise amplitude spectral density. The curves for the current observations are shown in red (dark for Hanford, light for Livingston). This is around a factor 3 better than in the final run of initial LIGO (green), but still a factor of 3 off design sensitivity (dark blue). The light blue curve shows the impact of potential future upgrades. The improvement at low frequencies is especially useful for high-mass systems like GW150914. Part of Fig. 1 of the Detector Paper. There are two compact binary coalescence searches that look for binary black holes: PyCBC and GstLAL. Both match templates to the data from the detectors to look for anything binary like, they then calculate the probability that such a match would happen by chance due to a random noise fluctuation (the false alarm probability or p-value [unhappy bonus note]). The false alarm probability isn’t the probability that there is a gravitational wave, but gives a good indication of how surprised we should be to find this signal if there wasn’t one. Here we report the results of both pipelines on the first 38.6 days of data (about 17 days where both detectors were working at the same time). Both searches use the same set of templates to look for binary black holes [bonus note]. They look for where the same template matches the data from both detectors within a time interval consistent with the travel time between the two. However, the two searches rank candidate events and calculate false alarm probabilities using different methods. Basically, both searches use a detection statistic (the quantity used to rank candidates: higher means less likely to be noise), that is based on the signal-to-noise ratio (how loud the signal is) and a goodness-of-fit statistic. They assess the significance of a particular value of this detection statistic by calculating how frequently this would be obtained if there was just random noise (this is done by comparing data from the two detectors when there is not a coincident trigger in both). Consistency between the two searches gives us greater confidence in the results. PyCBC’s detection statistic is a reweighted signal-to-noise ratio which takes into account the consistency of the signal in different frequency bands. You can get a large signal-to-noise ratio from a loud glitch, but this doesn’t match the template across a range of frequencies, which is why this test is useful. The consistency is quantified by a reduced chi-squared statistic. This is used, depending on its value, to weight the signal-to-noise ratio. When it is large (indicating inconsistency across frequency bins), the reweighted signal-to-noise ratio becomes smaller. To calculate the background, PyCBC uses time slides. Data from the two detectors are shifted in time so that any coincidences can’t be due to a real gravitational wave. Seeing how often you get something signal-like then tells you how often you’d expect this to happen due to random noise. GstLAL calculates the signal-to-noise ratio and a residual after subtracting the template. 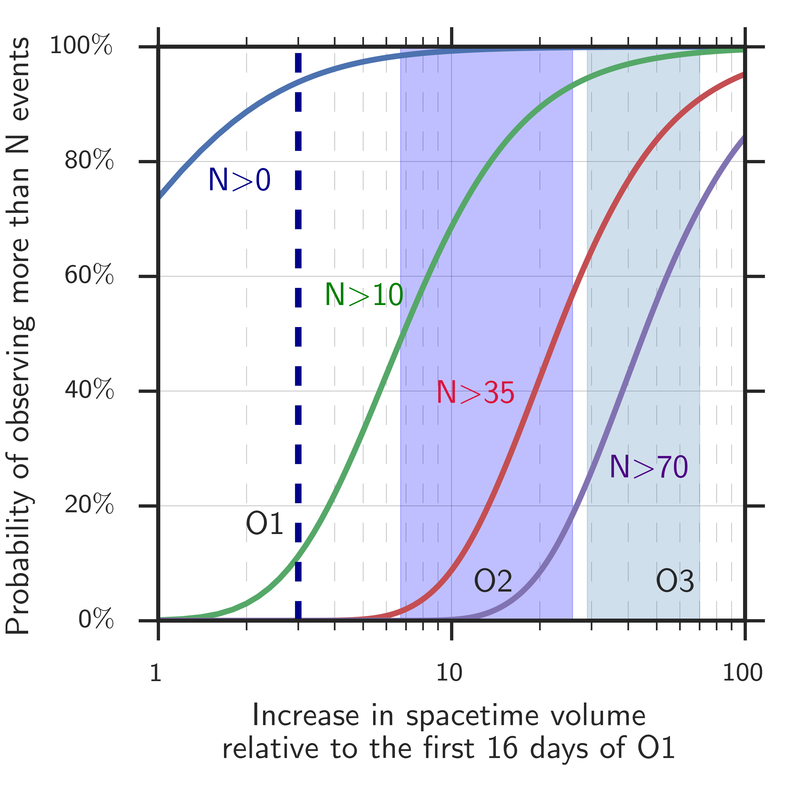 As a detection statistic, it uses a likelihood ratio : the probability of finding the particular values of the signal-to-noise ratio and residual in both detectors for signals (assuming signal sources are uniformly distributed isotropically in space), divided by the probability of finding them for noise. The background from GstLAL is worked out by looking at the likelihood ratio fro triggers that only appear in one detector. Since there’s no coincident signal in the other, these triggers can’t correspond to a real gravitational wave. Looking at their distribution tells you how frequently such things happen due to noise, and hence how probable it is for both detectors to see something signal-like at the same time. The results of the searches are shown in the figure below. Search results for PyCBC (left) and GstLAL (right). The histograms show the number of candidate events (orange squares) compare to the background. The black line includes GW150914 in the background estimate, the purple removes it (assuming that it is a signal). The further an orange square is above the lines, the more significant it is. Particle physicists like to quote significance in terms of and for some reason we’ve copied them. The second most significant event (around ) is LVT151012. Fig. 7 from the Compact Binary Coalescence Paper. GW150914 is the most significant event in both searches (it is the most significant PyCBC event even considering just single-detector triggers). They both find GW150914 with the same template values. The significance is literally off the charts. PyCBC can only calculate an upper bound on the false alarm probability of . GstLAL calculates a false alarm probability of , but this is reaching the level that we have to worry about the accuracy of assumptions that go into this (that the distribution of noise triggers in uniform across templates—if this is not the case, the false alarm probability could be about times larger). Therefore, for our overall result, we stick to the upper bound, which is consistent with both searches. The false alarm probability is so tiny, I don't think anyone doubts this signal is real. There is a second event that pops up above the background. This is LVT151012. It is found by both searches. Its signal-to-noise ratio is , compared with GW150914’s , so it is quiet. The false alarm probability from PyCBC is , and from GstLAL is , consistent with what we would expect for such a signal. LVT151012 does not reach the standards we would like to claim a detection, but it is still interesting. Running parameter estimation on LVT151012, as we did for GW150914, gives beautiful results. If it is astrophysical in origin, it is another binary black hole merger. The component masses are lower, and (the asymmetric uncertainties come from imposing ); the chirp mass is . The effective spin, as for GW150914, is close to zero . The luminosity distance is , meaning it is about twice as far away as GW150914’s source. I hope we’ll write more about this event in the future; there are some more details in the Rates Paper. Favourite part: We inferred the properties of black holes using measurements of spacetime itself! The gravitational wave signal encodes all sorts of information about its source. Here, we explain how we extract this information to produce probability distributions for the source parameters. I wrote about the properties of GW150914 in my previous post, so here I’ll go into a few more technical details. To measure parameters we match a template waveform to the data from the two instruments. The better the fit, the more likely it is that the source had the particular parameters which were used to generate that particular template. Changing different parameters has different effects on the waveform (for example, changing the distance changes the amplitude, while changing the relative arrival times changes the sky position), so we often talk about different pieces of the waveform containing different pieces of information, even though we fit the whole lot at once. The shape of the gravitational wave encodes the properties of the source. This information is what lets us infer parameters. The example signal is GW150914. I made this explainer with Ban Farr and Nutsinee Kijbunchoo for the LIGO Magazine. The waveform for a binary black hole merger has three fuzzily defined parts: the inspiral (where the two black holes orbit each other), the merger (where the black holes plunge together and form a single black hole) and ringdown (where the final black hole relaxes to its final state). Having waveforms which include all of these stages is a fairly recent development, and we’re still working on efficient ways of including all the effects of the spin of the initial black holes. The first we refer to as EOBNR, short for its proper name of SEOBNRv2_ROM_DoubleSpin. This is constructed by using some cunning analytic techniques to calculate the dynamics (known as effective-one-body or EOB) and tuning the results to match numerical relativity (NR) simulations. This waveform only includes the effects of spins aligned with the orbital angular momentum of the binary, so it doesn’t allow us to measure the effects of precession (wobbling around caused by the spins). The second we refer to as IMRPhenom, short for IMRPhenomPv2. This is constructed by fitting to the frequency dependence of EOB and NR waveforms. The dominant effects of precession of included by twisting up the waveform. We’re currently working on results using a waveform that includes the full effects of spin, but that is extremely slow (it’s about half done now), so those results won’t be out for a while. The results from the two waveforms agree really well, even though they’ve been created by different teams using different pieces of physics. This was a huge relief when I was first making a comparison of results! (We had been worried about systematic errors from waveform modelling). The consistency of results is partly because our models have improved and partly because the properties of the source are such that the remaining differences aren’t important. We’re quite confident that we’ve most of the parameters are reliably measured! The component masses are the most important factor for controlling the evolution of the waveform, but we don’t measure the two masses independently. The evolution of the inspiral is dominated by a combination called the chirp mass, and the merger and ringdown are dominated by the total mass. For lighter mass systems, where we gets lots of inspiral, we measure the chirp mass really well, and for high mass systems, where the merger and ringdown are the loudest parts, we measure the total mass. GW150914 is somewhere in the middle. The probability distribution for the masses are shown below: we can compensate for one of the component masses being smaller if we make the other larger, as this keeps chirp mass and total mass about the same. Estimated masses for the two black holes in the binary. Results are shown for the EOBNR waveform and the IMRPhenom: both agree well. The Overall results come from averaging the two. The dotted lines mark the edge of our 90% probability intervals. The sharp diagonal line cut-off in the two-dimensional plot is a consequence of requiring . Fig. 1 from the Parameter Estimation Paper. To work out these masses, we need to take into account the expansion of the Universe. As the Universe expands, it stretches the wavelength of the gravitational waves. The same happens to light: visible light becomes redder, so the phenomenon is known as redshifting (even for gravitational waves). If you don’t take this into account, the masses you measure are too large. To work out how much redshift there is you need to know the distance to the source. The probability distribution for the distance is shown below, we plot the distance together with the inclination, since both of these affect the amplitude of the waves (the source is quietest when we look at it edge-on from the side, and loudest when seen face-on/off from above/below). Estimated luminosity distance and binary inclination angle. An inclination of means we are looking at the binary (approximately) edge-on. Results are shown for the EOBNR waveform and the IMRPhenom: both agree well. The Overall results come from averaging the two. The dotted lines mark the edge of our 90% probability intervals. Fig. 2 from the Parameter Estimation Paper. After the masses, the most important properties for the evolution of the binary are the spins. We don’t measure these too well, but the probability distribution for their magnitudes and orientations from the precessing IMRPhenom model are shown below. Both waveform models agree that the effective spin , which is a combination of both spins in the direction of the orbital angular momentum) is small. Therefore, either the spins are small or are larger but not aligned (or antialigned) with the orbital angular momentum. The spin of the more massive black hole is the better measured of the two. Estimated orientation and magnitude of the two component spins from the precessing IMRPhenom model. The magnitude is between 0 and 1 and is perfectly aligned with the orbital angular momentum if the angle is 0. The distribution for the more massive black hole is on the left, and for the smaller black hole on the right. Part of Fig. 5 from the Parameter Estimation Paper. Read this if: You want to know more about the nature of gravity. The Testing General Relativity Paper is one of my favourites as it packs a lot of science in. Our first direct detection of gravitational waves and of the merger of two black holes provides a new laboratory to test gravity, and this paper runs through the results of the first few experiments. Before we start making any claims about general relativity being wrong, we first have to check if there’s any weird noise present. You don’t want to have to rewrite the textbooks just because of an instrumental artifact. After taking out a good guess for the waveform (as predicted by general relativity), we find that the residuals do match what we expect for instrumental noise, so we’re good to continue. I’ve written about a couple of tests of general relativity in my previous post: the consistency of the inspiral and merger–ringdown parts of the waveform, and the bounds on the mass of the graviton (from evolution of the signal). I’ll cover the others now. The final part of the signal, where the black hole settles down to its final state (the ringdown), is the place to look to check that the object is a black hole and not some other type of mysterious dark and dense object. It is tricky to measure this part of the signal, but we don’t see anything odd. We can’t yet confirm that the object has all the properties you’d want to pin down that it is exactly a black hole as predicted by general relativity; we’re going to have to wait for a louder signal for this. This test is especially poignant, as Steven Detweiler, who pioneered a lot of the work calculating the ringdown of black holes, died a week before the announcement. We can allow terms in our waveform (here based on the IMRPhenom model) to vary and see which values best fit the signal. If there is evidence for differences compared with the predictions from general relativity, we would have evidence for needing an alternative. Results for this analysis are shown below for a set of different waveform parameters : the parameters determine the inspiral, the parameters determine the merger–ringdown and the parameters cover the intermediate regime. If the deviation is zero, the value coincides with the value from general relativity. The plot shows what would happen if you allow all the variable to vary at once (the multiple results) and if you tried just that parameter on its own (the single results). Probability distributions for waveform parameters. The single analysis only varies one parameter, the multiple analysis varies all of them, and the J0737-3039 result is the existing bound from the double pulsar. A deviation of zero is consistent with general relativity. Fig. 7 from the Testing General Relativity Paper. Overall the results look good. Some of the single results are centred away from zero, but we think that this is just a random fluctuate caused by noise (we’ve seen similar behaviour in tests, so don’t panic yet). It’s not surprising the , and all show this behaviour, as they are sensitive to similar noise features. These measurements are much tighter than from any test we’ve done before, except for the measurement of which is better measured from the double pulsar (since we have lots and lots of orbits of that measured). The final test is to look for additional polarizations of gravitational waves. These are predicted in several alternative theories of gravity. Unfortunately, because we only have two detectors which are pretty much aligned we can’t say much, at least without knowing for certain the location of the source. Extra detectors will be useful here! In conclusion, we have found no evidence to suggest we need to throw away general relativity, but future events will help us to perform new and stronger tests. Before September 14, we had never seen a binary stellar-mass black hole system. We were therefore rather uncertain about how many we would see. We had predictions based on simulations of the evolution of stars and their dynamical interactions. These said we shouldn’t be too surprised if we saw something in O1, but that we shouldn’t be surprised if we didn’t see anything for many years either. We weren’t really expecting to see a black hole system so soon (the smart money was on a binary neutron star). However, we did find a binary black hole, and this happened right at the start of our observations! What do we now believe about the rate of mergers? To work out the rate, you first need to count the number of events you have detected and then work out how sensitive you are to the population of signals (how many could you see out of the total). 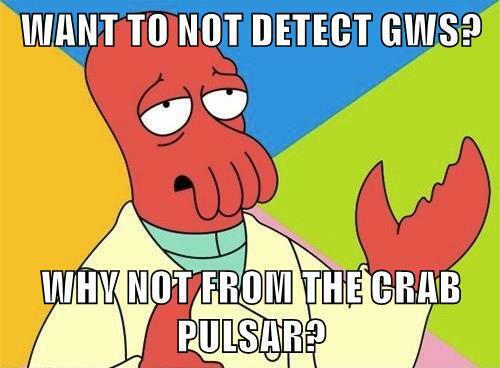 Counting detections sounds simple: we have GW150914 without a doubt. However, what about all the quieter signals? If you have 100 events each with a 1% probability of being real, then even though you can’t say with certainty that anyone is an actual signal, you would expect one to be so. We want to work out how many events are real and how many are due to noise. Handily, trying to tell apart different populations of things when you’re not certain about individual members is a common problem is astrophysics (where it’s often difficult to go and check what something actually is), so there exists a probabilistic framework for doing this. Using the expected number of real and noise events for a given detection statistic (as described in the Compact Binary Coalescence Paper), we count the number of detections and as a bonus, get a probability that each event is of astrophysical origin. There are two events with more than a 50% chance of being real: GW150914, where the probability is close to 100%, and LVT151012, where to probability is 84% based on GstLAL and 91% based on PyCBC. By injecting lots of fake signals into some data and running our detection pipelines, we can work out how sensitive they are (in effect, how far away can they find particular types of sources). For a given number of detections, the more sensitive we are, the lower the actual rate of mergers should be (for lower sensitivity we would miss more, while there’s no hiding for higher sensitivity). There is one final difficulty in working out the total number of binary black hole mergers: we need to know the distribution of masses, because our sensitivity depends on this. 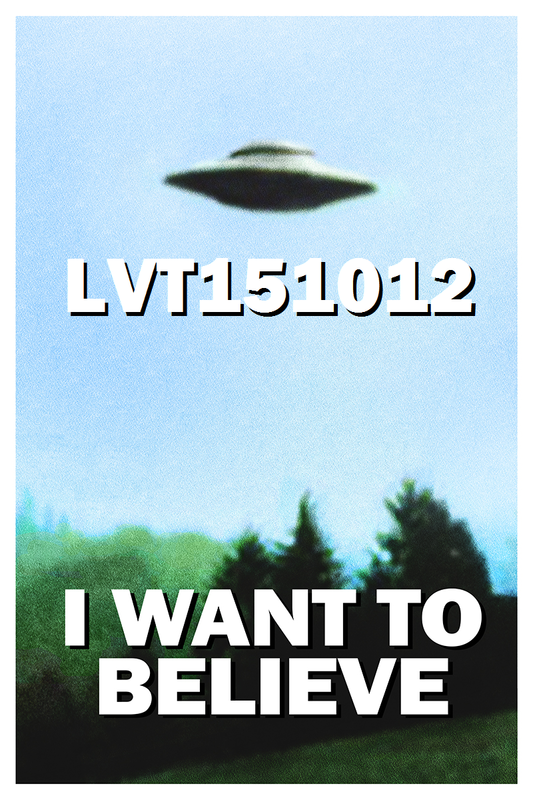 However, we don’t yet know this as we’ve only seen GW150914 and (maybe) LVT151012. Therefore, we try three possibilities to get an idea of what the merger rate could be. We assume that binary black holes are either like GW150914 or like LVT151012. Given that these are our only possible detections at the moment, this should give a reasonable estimate. A similar approach has been used for estimating the population of binary neutron stars from pulsar observations [bonus note]. The estimated merger rates (number of binary black hole mergers per volume per time) are then: 1. ; 2. , and 3. . There is a huge scatter, but the flat and power-law rates hopefully bound the true value. The percentage chance of making 0, 10, 35 and 70 more detections of binary black holes as time goes on and detector sensitivity improves (based upon our data so far). This is a simplified version of part of Fig. 3 of the Rates Paper taken from the science summary. When discussing what we can learn from gravitational wave astronomy, you can almost guarantee that someone will say something about discovering the unexpected. Whenever we’ve looked at the sky in a new band of the electromagnetic spectrum, we found something we weren’t looking for: pulsars for radio, gamma-ray burst for gamma-rays, etc. Can we do the same in gravitational wave astronomy? There may well be signals we weren’t anticipating out there, but will we be able to detect them? The burst pipelines have our back here, at least for short signals. The burst search pipelines, like their compact binary coalescence partners, assign candidate events a detection statistic and then work out a probability associated with being a false alarm caused by noise. The difference is that the burst pipelines try to find a wider range of signals. There are three burst pipelines described: coherent WaveBurst (cWB), which famously first found GW150914; omicron–LALInferenceBurst (oLIB), and BayesWave, which follows up on cWB triggers. As you might guess from the name, cWB looks for a coherent signal in both detectors. It looks for excess power (indicating a signal) in a time–frequency plot, and then classifies candidates based upon their structure. There’s one class for blip glitches and resonance lines (see the Detector Characterisation Paper), these are all thrown away as noise; one class for chirp-like signals that increase in frequency with time, this is where GW150914 was found, and one class for everything else. cWB’s detection statistic is something like a signal-to-noise ratio constructed based upon the correlated power in the detectors. The value for GW150914 was , which is higher than for any other candidate. The false alarm probability (or p-value), folding in all three search classes, is , which is pretty tiny, even if not as significant as for the tailored compact binary searches. The oLIB search has two stages. First it makes a time–frequency plot and looks for power coincident between the two detectors. Likely candidates are then followed up by matching a sine–Gaussian wavelet to the data, using a similar algorithm to the one used for parameter estimation. It’s detection statistic is something like a likelihood ratio for the signal verses noise. It calculates a false alarm probability of about too. BayesWave fits a variable number of sine–Gaussian wavelets to the data. This can model both a signal (when the wavelets are the same for both detectors) and glitches (when the wavelets are independent). This is really clever, but is too computationally expensive to be left running on all the data. Therefore, it follows up on things highlighted by cWB, potentially increasing their significance. It’s detection statistic is the Bayes factor comparing the signal and glitch models. It estimates the false alarm probability to be about (which agrees with the cWB estimate if you only consider chirp-like triggers). None of the searches find LVT151012. However, as this is a quiet, lower mass binary black hole, I think that this is not necessarily surprising. cWB and BayesWave also output a reconstruction of the waveform. Reassuringly, this does look like binary black hole coalescence! Gravitational waveforms from our analyses of GW150914. The wiggly grey line are the data from Hanford (top) and Livinston (bottom); these are analysed coherently. The plots show waveforms whitened by the noise power spectral density. The dark band shows the waveform reconstructed by BayesWave without assuming that the signal is from a binary black hole (BBH). The light bands show the distribution of BBH template waveforms that were found to be most probable from our parameter-estimation analysis. The two techniques give consistent results: the match between the two models is . Fig. 6 of the Parameter Estimation Paper. The paper concludes by performing some simple fits to the reconstructed waveforms. For this, you do have to assume that the signal cane from a binary black hole. They find parameters roughly consistent with those from the full parameter-estimation analysis, which is a nice sanity check of our results. The output from the detectors that we analyses for signals is simple. It is a single channel that records the strain. To monitor instrumental behaviour and environmental conditions the detector characterisation team record over 200,000 other channels. These measure everything from the alignment of the optics through ground motion to incidence of cosmic rays. Most of the data taken by LIGO is to monitor things which are not gravitational waves. 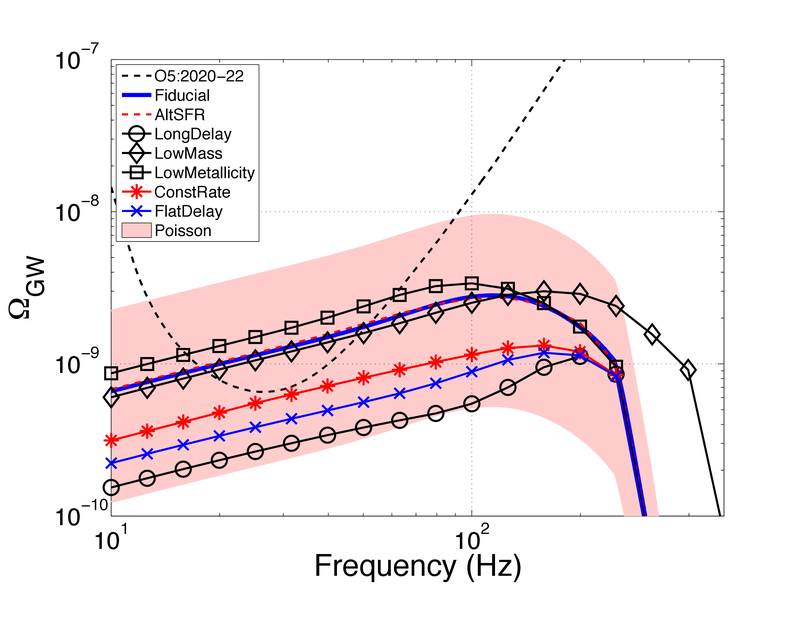 This paper examines all the potential sources of noise in the LIGO detectors, how we monitor them to ensure they are not confused for a signal, and the impact they could have on estimating the significance of events in our searches. It is amazingly thorough work. There are lots of potential noise sources for LIGO. Uncorrelated noise sources happen independently at both sites, therefore they can only be mistaken for a gravitational wave if by chance two occur at the right time. Correlated noise sources effect both detectors, and so could be more confusing for our searches, although there’s no guarantee that they would cause a disturbance that looks anything like a binary black hole merger. Ground motion caused by earthquakes or ocean waves. These create wibbling which can affect the instruments, even though they are well isolated. This is usually at low frequencies (below for earthquakes, although it can be higher if the epicentre is near), unless there is motion in the optics around (which can couple to cause higher frequency noise). There is a network of seismometers to measure earthquakes at both sites. There where two magnitude 2.1 earthquakes within 20 minutes of GW150914 (one off the coast of Alaska, the other south-west of Seattle), but both produced ground motion that is ten times too small to impact the detectors. There was some low frequency noise in Livingston at the time of LVT151012 which is associated with a period of bad ocean waves. however, there is no evidence that these could be converted to the frequency range associated with the signal. People moving around near the detectors can also cause vibrational or acoustic disturbances. People are kept away from the detectors while they are running and accelerometers, microphones and seismometers monitor the environment. Modulation of the lasers at and is done to monitor and control several parts of the optics. There is a fault somewhere in the system which means that there is a coupling to the output channel and we get noise across to , which is where we look for compact binary coalescences. Rai Weiss suggested shutting down the instruments to fix the source of this and delaying the start of observations—it’s a good job we didn’t. Periods of data where this fault occurs are flagged and not included in the analysis. Blip transients are a short glitch that occurs for unknown reasons. They’re quite mysterious. They are at the right frequency range ( to ) to be confused with binary black holes, but don’t have the right frequency evolution. They contribute to the background of noise triggers in the compact binary coalescence searches, but are unlikely to be the cause of GW150914 or LVT151012 since they don’t have the characteristic chirp shape. 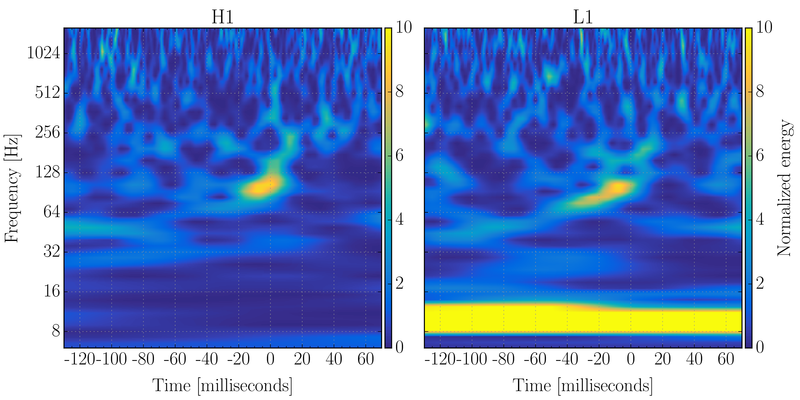 A time–frequency plot of a blip glitch in LIGO-Livingston. Blip glitches are the right frequency range to be confused with binary coalescences, but don’t have the chirp-like structure. Blips are symmetric in time, whereas binary coalescences sweep up in frequency. Fig. 3 of the Detector Characterisation Paper. Electromagnetic signals which can come from lightning, solar weather or radio communications. This is measured by radio receivers and magnetometers, and its extremely difficult to produce a signal that is strong enough to have any impact of the detectors’ output. There was one strong (peak current of about ) lightning strike in the same second as GW150914 over Burkino Faso. However, the magnetic disturbances were at least a thousand times too small to explain the amplitude of GW150914. Cosmic ray showers can cause electromagnetic radiation and particle showers. The particle flux become negligible after a few kilometres, so it’s unlikely that both Livingston and Hanford would be affected, but just in case there is a cosmic ray detector at Hanford. It has seen nothing suspicious. All the monitoring channels give us a lot of insight into the behaviour of the instruments. Times which can be identified as having especially bad noise properties (where the noise could influence the measured output), or where the detectors are not working properly, are flagged and not included in the search analyses. Applying these vetoes mean that we can’t claim a detection when we know something else could mimic a gravitational wave signal, but it also helps us clean up our background of noise triggers. This has the impact of increasing the significance of the triggers which remain (since there are fewer false alarms they could be confused with). For example, if we leave the bad period in, the PyCBC false alarm probability for LVT151012 goes up from to . The significance of GW150914 is so great that we don’t really need to worry about the effects of vetoes. At the time of GW150914 the detectors were running well, the data around the event are clean, and there is nothing in any of the auxiliary channels that record anything which could have caused the event. The only source of a correlated signal which has not been rules out is a gravitational wave from a binary black hole merger. The time–frequency plots of the measured strains are shown below, and its easy to pick out the chirps. Time–frequency plots for GW150914 as measured by Hanford (left) and Livingston (right). These show the characteristic increase in frequency with time of the chirp of a binary merger. The signal is clearly visible above the noise. Fig. 10 of the Detector Characterisation Paper. The data around LVT151012 are significantly less stationary than around GW150914. There was an elevated noise transient rate around this time. This is probably due to extra ground motion caused by ocean waves. This low frequency noise is clearly visible in the Livingston time–frequency plot below. There is no evidence that this gets converted to higher frequencies though. None of the detector characterisation results suggest that LVT151012 has was caused by a noise artifact. Time–frequency plots for LVT151012 as measured by Hanford (left) and Livingston (right). You can see the characteristic increase in frequency with time of the chirp of a binary merger, but this is mixed in with noise. The scale is reduced compared with for GW150914, which is why noise features appear more prominent. The band at low frequency in Livingston is due to ground motion; this is not present in Hanford. Fig. 13 of the Detector Characterisation Paper. If you’re curious about the state of the LIGO sites and their array of sensors, you can see more about the physical environment monitors at pem.ligo.org. We want to measure the gravitational wave strain—the change in length across our detectors caused by a passing gravitational wave. What we actually record is the intensity of laser light out the output of our interferometer. (The output should be dark when the strain is zero, and the intensity increases when the interferometer is stretched or squashed). We need a way to convert intensity to strain, and this requires careful calibration of the instruments. The calibration is complicated by the control systems. The LIGO instruments are incredibly sensitive, and maintaining them in a stable condition requires lots of feedback systems. These can impact how the strain is transduced into the signal readout by the interferometer. A schematic of how what would be the change in the length of the arms without control systems is changed into the measured strain is shown below. The calibration pipeline build models to correct for the effects of the control system to provide an accurate model of the true gravitational wave strain. Model for how a differential arm length caused by a gravitational wave or a photon calibration signal is converted into the measured signal . Fig. 2 from the Calibration Paper. To measure the different responses of the system, the calibration team make several careful measurements. The primary means is using photon calibration: an auxiliary laser is used to push the mirrors and the response is measured. The spots where the lasers are pointed are carefully chosen to minimise distortion to the mirrors caused by pushing on them. A secondary means is to use actuators which are parts of the suspension system to excite the system. As a cross-check, we can also use two auxiliary green lasers to measure changes in length using either a frequency modulation or their wavelength. These are similar approaches to those used in initial LIGO. These go give consistent results with the other methods, but they are not as accurate. Overall, the uncertainty in the calibration of the amplitude of the strain is less than between and , and the uncertainty in phase calibration is less than . These are the values that we use in our parameter-estimation runs. However, the calibration uncertainty actually varies as a function of frequency, with some ranges having much less uncertainty. We’re currently working on implementing a better model for the uncertainty, which may improve our measurements. Fortunately the masses, aren’t too affected by the calibration uncertainty, but sky localization is, so we might get some gain here. We’ll hopefully produce results with updated calibration in the near future. This paper puts our observations of GW150914 in context with regards to existing observations of stellar-mass black holes and theoretical models for binary black hole mergers. Although it doesn’t explicitly mention LVT151012, most of the conclusions would be just as applicable to it’s source, if it is real. I expect there will be rapid development of the field now, but if you want to catch up on some background reading, this paper is the place to start. The paper contains lots of references to good papers to delve into. It also highlights the main conclusion we can draw in italics, so its easy to skim through if you want a summary. I discussed the main astrophysical conclusions in my previous post. We will know more about binary black holes and their formation when we get more observations, so I think it is a good time to get interested in this area. A stochastic gravitational wave background could be created by an incoherent superposition of many signals. In pulsar timing, they are looking for a background from many merging supermassive black holes. Could we have a similar thing from stellar-mass black holes? The loudest signals, like GW150914, are resolvable, they stand out from the background. However, for every loud signal, there will be many quiet signals, and the ones below our detection threshold could form a background. Since we’ve found that binary black hole mergers are probably plentiful, the background may be at the high end of previous predictions. The background from stellar-mass black holes is different than the one from supermassive black holes because the signals are short. While the supermassive black holes produce an almost constant hum throughout your observations, stellar-mass black hole mergers produce short chirps. Instead of having lots of signals that overlap in time, we have a popcorn background, with one arriving on average every 15 minutes. This might allow us to do some different things when it comes to detection, but for now, we just use the standard approach. This paper calculates the energy density of gravitational waves from binary black holes, excluding the contribution from signals loud enough to be detected. This is done for several different models. The standard (fiducial) model assumes parameters broadly consistent with those of GW150914’s source, plus a particular model for the formation of merging binaries. There are then variations on the the model for formation, considering different time delays between formation and merger, and adding in lower mass systems consistent with LVT151012. All these models are rather crude, but give an idea of potential variations in the background. Hopefully more realistic distributions will be considered in the future. There is some change between models, but this is within the (considerable) statistical uncertainty, so predictions seems robust. Different models for the stochastic background of binary black holes. This is plotted in terms of energy density. The red band indicates the uncertainty on the fiducial model. The dashed line indicates the sensitivity of the LIGO and Virgo detectors after several years at design sensitivity. Fig. 2 of the Stochastic Paper. After a couple of years at design sensitivity we may be able to make a confident detection of the stochastic background. The background from binary black holes is more significant than we expected. If you’re wondering about if we could see other types of backgrounds, such as one of cosmological origin, then the background due to binary black holes could make detection more difficult. In effect, it acts as another source of noise, masking the other background. However, we may be able to distinguish the different backgrounds by measuring their frequency dependencies (we expect them to have different slopes), if they are loud enough. There are multiple detectors that can look for high energy neutrinos. Currently, LIGO–Virgo Observations are being followed up by searches from ANTARES and IceCube. Both of these are Cherenkov detectors: they look for flashes of light created by fast moving particles, not the neutrinos themselves, but things they’ve interacted with. ANTARES searches the waters of the Mediterranean while IceCube uses the ice of Antarctica. Within 500 seconds either side of the time of GW150914, ANTARES found no neutrinos and IceCube found three. These results are consistent with background levels (you would expect on average less than one and 4.4 neutrinos over that time from the two respectively). Additionally, none of the IceCube neutrinos are consistent with the sky localization of GW150914 (even though the sky area is pretty big). There is no sign of a neutrino counterpart, which is what we were expecting. Subsequent non-detections have been reported by KamLAND, the Pierre Auger Observatory, Super-Kamiokande and Borexino. This is the last of the set of companion papers to be released—it took a huge amount of coordinating because of all the teams involved. The paper describes how we released information about GW150914. This should not be typical of how we will do things going forward (i) because we didn’t have all the infrastructure in place on September 14 and (ii) because it was the first time we had something we thought was real. The first announcement was sent out on September 16, and this contained sky maps from the Burst codes cWB and LIB. In the future, we should be able to send out automated alerts with a few minutes latency. For the first alert, we didn’t have any results which assumed the the source was a binary, as the searches which issue triggers at low latency were only looking for lower mass systems which would contain a neutron star. I suspect we’ll be reprioritising things going forward. The first information we shared about the potential masses for the source was shared on October 3. Since this was the first detection, everyone was cautious about triple-checking results, which caused the delay. Revised false alarm rates including results from GstLAL and PyCBC were sent out October 20. The final sky maps were shared January 13. This is when we’d about finished our own reviews and knew that we would be submitting the papers soon [bonus note]. 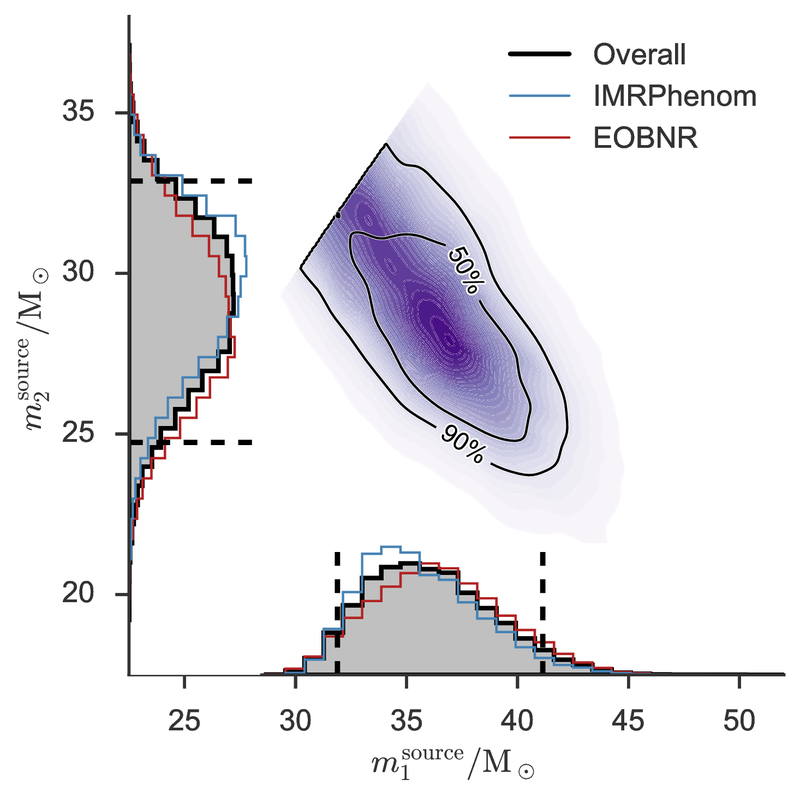 Our best sky map is the one from the Parameter Estimation Paper. You might it expect to be more con straining than the results from the burst pipelines since it uses a proper model for the gravitational waves from a binary black hole. This is the case if we ignore calibration uncertainty (which is not yet included in the burst codes), then the 50% area is and the 90% area is . However, including calibration uncertainty, the sky areas are and at 50% and 90% probability respectively. Calibration uncertainty has the largest effect on sky area. All the sky maps agree that the source is in in some region of the annulus set by the time delay between the two detectors. The different sky maps for GW150914 in an orthographic projection. The contours show the 90% region for each algorithm. The faint circles show lines of constant time delay between the two detectors. BAYESTAR rapidly computes sky maps for binary coalescences, but it needs the output of one of the detection pipelines to run, and so was not available at low latency. The LALInference map is our best result. All the sky maps are available as part of the data release. Fig. 2 of the Electromagnetic Follow-up Paper. A timeline of events is shown below. There were follow-up observations across the electromagnetic spectrum from gamma-rays and X-rays through the optical and near infra-red to radio. Timeline for observations of GW15014. The top (grey) band shows information about gravitational waves. The second (blue) band shows high-energy (gamma- and X-ray) observations. The third and fourth (green) bands show optical and near infra-red observations respectively. The bottom (red) band shows radio observations. Fig. 1 from the Electromagnetic Follow-up Paper. Together they cover an impressive amount of the sky as shown below. Many targeted the Large Magellanic Cloud before the knew the source was a binary black hole. Footprints of observations compared with the 50% and 90% areas of the initially distributed (cWB: thick lines; LIB: thin lines) sky maps, also in orthographic projection. The all-sky observations are not shown. The grey background is the Galactic plane. Fig. 3 of the Electromagnetic Follow-up Paper. Additional observations have been done using archival data by XMM-Newton and AGILE. We don’t expect any electromagnetic counterpart to a binary black hole. No-one found anything with the exception of Fermi GBM. This has found a weak signal which may be coincident. More work is required to figure out if this is genuine (the statistical analysis looks OK, but some times you do have a false alarm). It would be a surprise if it is, so most people are sceptical. However, I think this will make people more interested in following up on our next binary black hole signal! GW150914 is the name we have given to the signal detected by the two LIGO instruments. The “GW” is short for gravitational wave (not galactic worm), and the numbers give the date the wave reached the detectors (2015 September 14). It was originally known as G184098, its ID in our database of candidate events (most circulars sent to and from our observer partners use this ID). That was universally agreed to be terrible to remember. We tried to think of a good nickname for the event, but failed to, so rather by default, it has informally become known as The Event within the Collaboration. I think this is fitting given its significance. LVT151012 is the name of the most significant candidate after GW150914, it doesn’t reach our criteria to claim detection (a false alarm rate of less than once per century), which is why it’s not GW151012. The “LVT” is short for LIGO–Virgo trigger. It took a long time to settle on this and up until the final week before the announcement it was still going by G197392. Informally, it was known as The Second Monday Event, as it too was found on a Monday. You’ll have to wait for us to finish looking at the rest of the O1 data to see if the Monday trend continues. If it does, it could have serious repercussions for our understanding of Garfield. Following the publication of the O2 Catalogue Paper, LVT151012 was upgraded to GW151012, AND we decided to get rid of the LVT class as it was rather confusing. Several people have asked me if the Discovery Paper was submitted to Science or Nature. It was not. The decision that any detection would be submitted to Physical Review was made ahead of the run. As far as I am aware, there was never much debate about this. Physical Review had been good about publishing all our non-detections and upper limits, so it only seemed fair that they got the discovery too. You don’t abandon your friends when you strike it rich. I am glad that we submitted to them. Gaby González, the LIGO Spokesperson, contacted the editors of Physical Review Letters ahead of submission to let them know of the anticipated results. They then started to line up some referees to give confidential and prompt reviews. The initial plan was to submit on January 19, and we held a Collaboration-wide tele-conference to discuss the science. There were a few more things still to do, so the paper was submitted on January 21, following another presentation (and a long discussion of whether a number should be a six or a two) and a vote. The vote was overwhelmingly in favour of submission. The paper is extremely well written and clear. These results are obviously going to make history. This paper is a major breakthrough and a milestone in gravitational science. The results are overall very well presented and its suitability for publication in Physical Review Letters is beyond question. It is an honor to have the opportunity to review this paper. It would not be an exaggeration to say that it is the most enjoyable paper I’ve ever read. […] I unreservedly recommend the paper for publication in Physical Review Letters. I expect that it will be among the most cited PRL papers ever. I suspect I will never have such emphatic reviews again [happy bonus note][unhappy bonus note]. Publishing in Physical Review Letters seems to have been a huge success. So much so that their servers collapsed under the demand, despite them adding two more in anticipation. In the end they had to quintuple their number of servers to keep up with demand. There were 229,000 downloads from their website in the first 24 hours. Many people remarked that it was good that the paper was freely available. However, we always make our papers public on the arXiv or via LIGO’s Document Control Center [bonus bonus note], so there should never be a case where you miss out on reading a LIGO paper! This is a beautiful paper on a spectacular result. The paper is also very well written, and includes enough background that I think a decent fraction of it will be accessible to non-experts. This, together with the profound nature of the results (first direct detection of gravitational waves, first direct evidence that Kerr black holes exist, first direct evidence that binary black holes can form and merge in a Hubble time, first data on the dynamical strong-field regime of general relativity, observation of stellar mass black holes more massive than any observed to date in our galaxy), makes me recommend this paper for publication in PRL without hesitation. This is a generally excellent paper describing the properties of LIGO’s first detection. Physical Review Letters were also kind enough to publish this paper open access without charge! While overall I’ve been impressed with the statistics in LIGO papers, in one respect there is truly egregious malpractice, but fortunately easy to remedy. It concerns incorrectly using the term “false alarm probability” (FAP) to refer to what statisticians call a p-value, a deliberately vague term (“false alarm rate” is similarly misused). […] There is nothing subtle or controversial about the LIGO usage being erroneous, and the practice has to stop, not just within this paper, but throughout the LIGO collaboration (and as a matter of ApJ policy). I agree with this. What we call the false alarm probability is not the probability that the detection is a false alarm. It is not the probability that the given signal is noise rather that astrophysical, but instead it is the probability that if we only had noise that we would get a detection statistic as significant or more so. It might take a minute to realise why those are different. The former (the one we should call p-value) is what the search pipelines give us, but is less useful than the latter for actually working out if the signal is real. The probabilities calculated in the Rates Paper that the signal is astrophysical are really what you want. As a consequence of this complaint, the Collaboration is purging “false alarm probability” from our papers. It is used in most of the companion papers, as they were published before we got this report (and managed to convince everyone that it is important). Regarding scholarship, the paper is quite poor. I take it the authors have written this paper with the expectation, or at least the hope, that it would be read […] If I sound frustrated, it’s because I am. This is fair enough. The referee made some good suggestions to work done on inferring the rate of gamma-ray bursts by Loredo & Wasserman (Part I, Part II, Part III), as well as by Petit, Kavelaars, Gladman & Loredo on trans-Neptunian objects, and we made sure to add as much work as possible in revisions. There’s no excuse for not properly citing useful work! Third, the referee didn’t understand how we could be certain of the distribution of signal-to-noise ratio without also worrying about the distribution of parameters like the black hole masses. The signal-to-noise ratio is inversely proportional to distance, and we expect sources to be uniformly distributed in volume. Putting these together (and ignoring corrections from cosmology) gives a distribution for signal-to-noise ratio of (Schulz 2011). This is sufficiently well known within the gravitational-wave community that we forgot that those outside wouldn’t appreciate it without some discussion. Therefore, it was useful that the referee did point this out. Unfortunately, they were missing some terms in their expressions. When these were added in, their approach reproduced our own (I had a go at checking this myself). Given that we had annoyed the referee on so many other points, it was tricky trying to convince them of this. Most of the time spent responding to the referees was actually working on the referee response and not on the paper. Finally, the referee was unhappy that we didn’t make all our data public so that they could check things themselves. I think it would be great, and it will happen, it was just too early at the time. Sorry folks! Papers in the LIGO Document Control Center are assigned a number starting with P (for “paper”) and then several digits. The Discover Paper’s reference is P150914. I only realised why this was the case on the day of submission. The set of templates used in the searches is designed to be able to catch binary neutron stars, neutron star–black hole binaries and binary neutron stars. It covers component masses from 1 to 99 solar masses, with total masses less than 100 solar masses. The upper cut off is chosen for computational convenience, rather than physical reasons: we do look for higher mass systems in a similar way, but they are easier to confuse with glitches and so we have to be more careful tuning the search. Since bank of templates is so comprehensive, it is known as the überbank. Although it could find binary neutron stars or neutron star–black hole binaries, we only discuss binary black holes here. The template bank doesn’t cover the full parameter space, in particular it assumes that spins are aligned for the two components. This shouldn’t significantly affect its efficiency at finding signals, but gives another reason (together with the coarse placement of templates) why we need to do proper parameter estimation to measure properties of the source. In the calculation of rates, the probabilistic means for counting sources is known as the FGMC method after its authors (who include two Birmingham colleagues and my former supervisor). The means of calculating rates assuming that the population is divided into one class to match each observation is also named for the initial of its authors as the KKL approach. The combined FGMCKKL method for estimating merger rates goes by the name alphabet soup, as that is much easier to swallow. The prospect of detecting a binary black hole with a space-based detector and then seeing the same binary merger with ground-based detectors is especially exciting. My officemate Alberto Sesana (who’s not in LIGO) has just written a paper on the promise of multi-band gravitational wave astronomy. Black hole binaries like GW150914 could be spotted by eLISA (if you assume one of the better sensitivities for a detector with three arms). Then a few years to weeks later they merge, and spend their last moments emitting in LIGO’s band. The evolution of some binary black holes is sketched in the plot below. The evolution of binary black hole mergers (shown in blue). The eLISA and Advanced LIGO sensitivity curves are shown in purple and orange respectively. As the black holes inspiral, they emit gravitational waves at higher frequency, shifting from the eLISa band to the LIGO band (where they merge). The scale at the top gives the approximate time until merger. Fig. 1 of Sesana (2016). Seeing the signal in two bands can help in several ways. First it can increase our confidence in detection, potentially picking out signals that we wouldn’t otherwise. Second, it gives us a way to verify the calibration of our instruments. 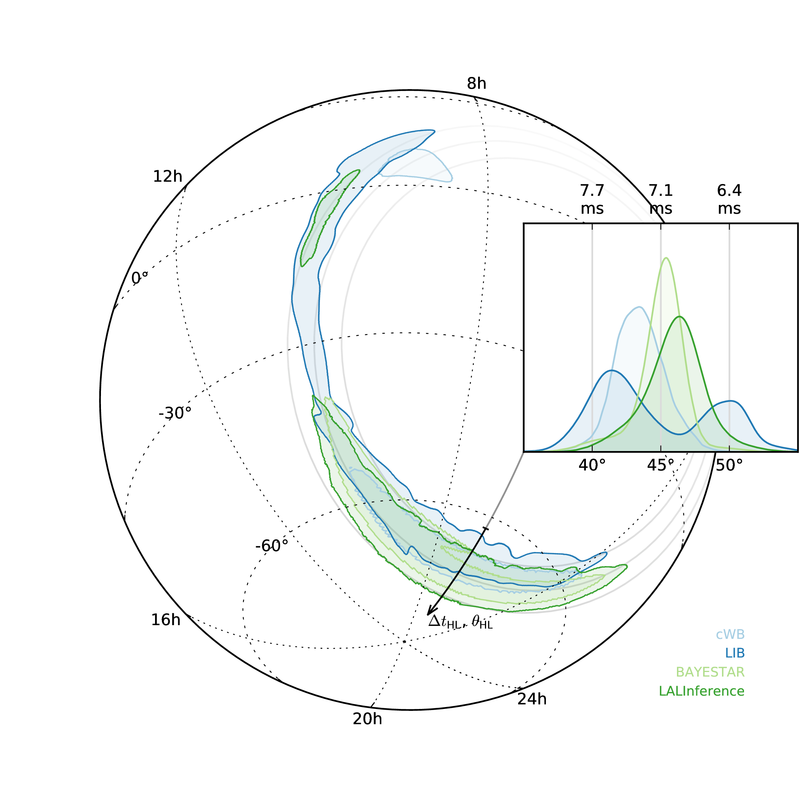 Third, it lets us improve our parameter-estimation precision—eLISA would see thousands of cycles, which lets it pin down the masses to high accuracy, these results can be combined with LIGO’s measurements of the strong-field dynamics during merger to give a fantastic overall picture of the system. Finally, since eLISA can measure the signal for a considerable time, it can well localise the source, perhaps just to a square degree; since we’ll also be able to predict when the merger will happen, you can point telescopes at the right place ahead of time to look for any electromagnetic counterparts which may exist. Opening up the gravitational wave spectrum is awesome! It is an exciting time time in LIGO. The start of the first observing run (O1) is imminent. I think they just need to sort out a button that is big enough and red enough (or maybe gather a little more calibration data… ), and then it’s all systems go. Making the first direct detection of gravitational waves with LIGO would be an enormous accomplishment, but that’s not all we can hope to achieve: what I’m really interested in is what we can learn from these gravitational waves. The LIGO Magazine gives a glimpse inside the workings of the LIGO Scientific Collaboration, covering everything from the science of the detector to what collaboration members like to get up to in their spare time. The most recent issue was themed around how gravitational-wave science links in with the rest of astronomy. I enjoyed it, as I’ve been recently working on how to help astronomers look for electromagnetic counterparts to gravitational-wave signals. It also features a great interview with Joseph Taylor Jr., one of the discoverers of the famous Hulse–Taylor binary pulsar. The back cover features an article I wrote about parameter estimation: an expanded version is below. How does parameter estimation work? Detecting gravitational waves is one of the great challenges in experimental physics. A detection would be hugely exciting, but it is not the end of the story. Having observed a signal, we need to work out where it came from. This is a job for parameter estimation! How we analyse the data depends upon the type of signal and what information we want to extract. I’ll use the example of a compact binary coalescence, that is the inspiral (and merger) of two compact objects—neutron stars or black holes (not marshmallows). Parameters that we are interested in measuring are things like the mass and spin of the binary’s components, its orientation, and its position. For a particular set of parameters, we can calculate what the waveform should look like. This is actually rather tricky; including all the relevant physics, like precession of the binary, can make for some complicated and expensive-to-calculate waveforms. The first part of the video below shows a simulation of the coalescence of a black-hole binary, you can see the gravitational waveform (with characteristic chirp) at the bottom. We can compare our calculated waveform with what we measured to work out how well they fit together. If we take away the wave from what we measured with the interferometer, we should be left with just noise. We understand how our detectors work, so we can model how the noise should behave; this allows us to work out how likely it would be to get the precise noise we need to make everything match up. To work out the probability that the system has a given parameter, we take the likelihood for our left-over noise and fold in what we already knew about the values of the parameters—for example, that any location on the sky is equally possible, that neutron-star masses are around 1.4 solar masses, or that the total mass must be larger than that of a marshmallow. For those who like details, this is done using Bayes’ theorem. We now want to map out this probability distribution, to find the peaks of the distribution corresponding to the most probable parameter values and also chart how broad these peaks are (to indicate our uncertainty). Since we can have many parameters, the space is too big to cover with a grid: we can’t just systematically chart parameter space. Instead, we randomly sample the space and construct a map of its valleys, ridges and peaks. Doing this efficiently requires cunning tricks for picking how to jump between spots: exploring the landscape can take some time, we may need to calculate millions of different waveforms! Having computed the probability distribution for our parameters, we can now tell an astronomer how much of the sky they need to observe to have a 90% chance of looking at the source, give the best estimate for the mass (plus uncertainty), or even figure something out about what neutron stars are made of (probably not marshmallow). This is the beginning of gravitational-wave astronomy! Monty, Carla and the other samplers explore the probability landscape. Nutsinee Kijbunchoo drew the version for the LIGO Magazine. A new paper from the LIGO Scientific Collaboration has snuck out. It was actually published back in March but I didn’t notice it, nearly risking my New Year’s resolution. This is another paper on continuous waves from rotating neutron stars, so it’s a little outside my area of expertise. However, there is an official science summary written by people who do know what they’re talking about. The paper looks at detecting gravitational waves from a spinning neutron star. We didn’t find any. However, we have slightly improved our limit for how loud they need to be before we would have detected them, which is nice. Neutron stars can rotate rapidly. They can be spun up if they accrete material from a disc orbiting them. If they neutron star has an asymmetry, if it has a little bump, as it rotates it emits gravitational waves. The gravitational waves carry away angular momentum, which should spin down the neutron star. This becomes more effective as the angular velocity increases. At some point you expect that the spin-up effect from accretion balances the spin-down effect of gravitational waves and you are left with a neutron star spinning at pretty constant velocity. We have some evidence that this might happen, as low-mass X-ray binaries seem to have their spins clustered in a small range of frequencies. Assuming we do have this balance, we are looking for a continuous gravitational wave with constant frequency, a rather dull humming. Scorpius X-1 is the brightest X-ray source in the sky. It contains a neutron star, so it’s a good place to check for gravitational waves from neutron stars. In this case, we’re using data from initial LIGO’s fifth science run (4 November 2005–1 October 2007). This has been done before, but this paper implements some new techniques. I expect that the idea is to test things out ahead of getting data with Advanced LIGO. 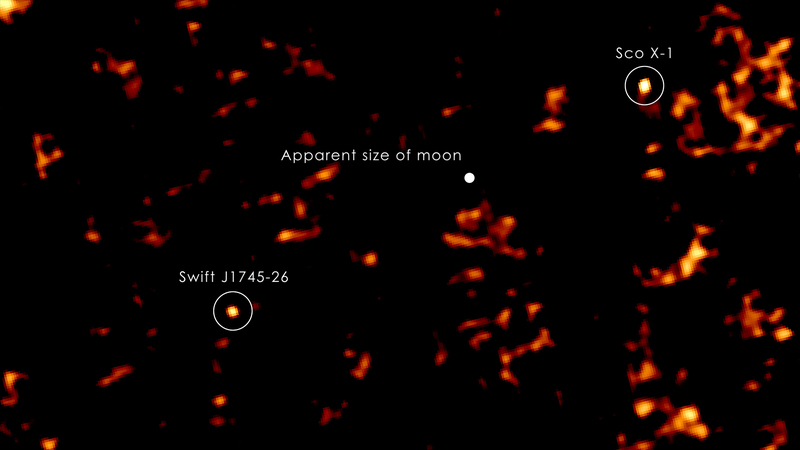 Swift X-ray Telescope image of Scorpius X-1 and the X-ray nova J1745-26 (a stellar-mass black hole), along with the scale of moon, as they would appear in the field of view from Earth. Credit: NASA/Goddard Space Flight Center/S. Immler and H. Krimm. A limit of 10 days’ worth of data is used, as this should be safely within the time taken for the rotational frequency to fluctuate by a noticeable amount due to variation in the amount of accretion. In human terms, that would be the time between lunch and dinner, where your energy levels change because of how much you’ve eaten. They picked data from 21–31 August 2007, as their favourite (it has the best noise performance over the frequency range of interest), and used two other segments to double-check their findings. We’d be able to use more data if we knew how the spin wandered with time. We already know a lot about Scorpius X-1 from electromagnetic observations (like where it is and its orbital parameters). We don’t know its spin frequency, but we might have an idea about the orientation of its spin if this coincides with radio jets. The paper considers two cases: one where we don’t know anything about the spin orientation, and one where we use information from the jets. The results are similar in both cases. As the neutron star orbits in its binary system, it moves back and forth which Doppler shifts the gravitational waves. This adds a little interest to the hum, spreading it out over a range of frequencies. The search looks for gravitational waves over this type of frequency range, which they refer to as sidebands. There are a few events where it looks like there is something, but after carefully checking, these look like they are entirely consistent with noise. I guess this isn’t too surprising. Since they didn’t detect anything, they can only impose an upper limit. This is stronger than the previous upper limit, but only by a factor of about 1.4. This might not sound too great, but the previous analysis used a year of data, whereas this only used 10 days. This method therefore saves a lot on computational time. The result of the paper is quite nice, but not too exciting. If it were a biscuit, it’d probably be a rich tea. It’s nice to have, but it’s not a custard cream. 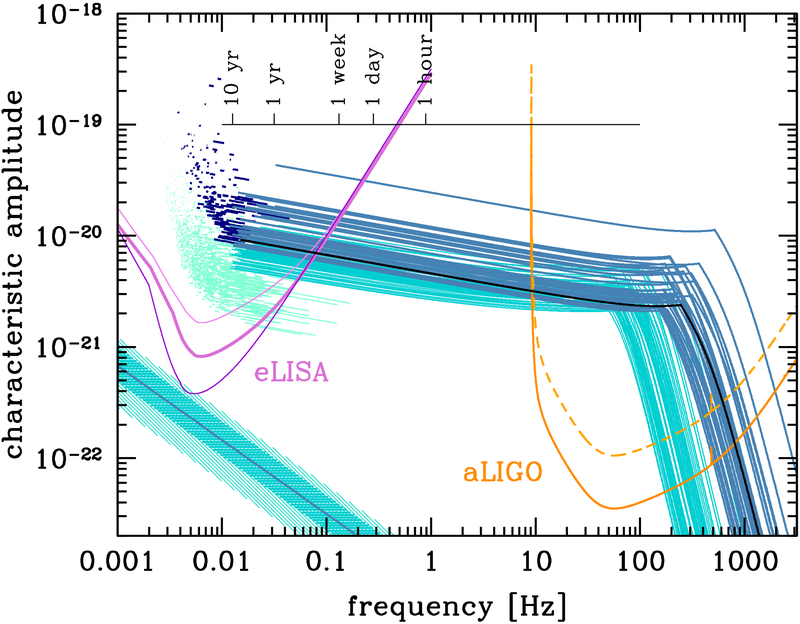 Continuing with my New Year’s resolution to write a post on every published paper, the start of March see another full author list LIGO publication. Appearing in Classical & Quantum Gravity, the minimalistically titled Advanced LIGO is an instrumental paper. It appears a part of a special focus issue on advanced gravitational-wave detectors, and is happily free to read (good work there). This is The Paper™ for describing how the advanced detectors operate. I think it’s fair to say that my contribution to this paper is 0%. LIGO stands for Laser Interferometer Gravitational-wave Observatory. As you might imagine, LIGO tries to observe gravitational waves by measuring them with a laser interferometer. (It won’t protect your fencing). Gravitational waves are tiny, tiny stretches and squeezes of space. To detect them we need to measure changes in length extremely accurately. I had assumed that Advanced LIGO will achieve this supreme sensitivity through some dark magic invoked by sacrificing the blood, sweat, tears and even coffee of many hundreds of PhD students upon the altar of science. However, this paper actually shows it’s just really, really, REALLY careful engineering. And giant frickin’ laser beams. The paper goes through each aspect of the design of the LIGO detectors. It starts with details of the interferometer. LIGO uses giant lasers to measure distances extremely accurately. Lasers are bounced along two 3994.5 m arms and interfered to measure a change in length between the two. In spirit, it is a giant Michelson interferometer, but it has some cunning extra features. Each arm is a Fabry–Pérot etalon, which means that the laser is bounced up and down the arms many times to build up extra sensitivity to any change in length. There are various extra components to make sure that the laser beam is as stable as possible, all in all, there are rather a lot of mirrors, each of which is specially tweaked to make sure that some acronym is absolutely perfect. Fig. 1 from Aasi et al. 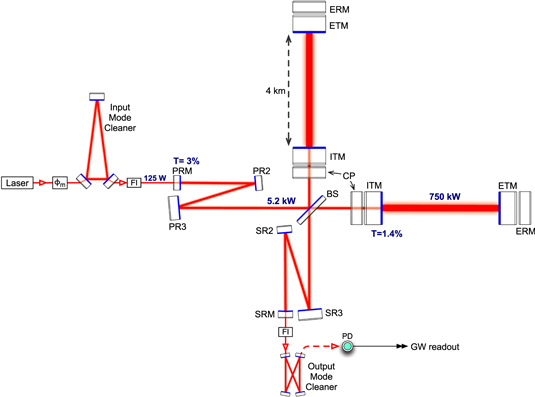 (2015), the Advanced LIGO optical configuration. All the acronyms have to be carefully placed in order for things to work. The laser beam starts from the left, passing through subsystems to make sure it’s stable. It is split in two to pass into the interferometer arms at the top and right of the diagram. The laser is bounced many times between the mirrors to build up sensitivity. The interference pattern is read out at the bottom. Normally, the light should interfere destructively, so the output is dark. A change to this indicates a change in length between the arms. That could be because of a passing gravitational wave. The next section deals with all the various types of noise that affect the detector. It’s this noise that makes it such fun to look for the signals. To be honest, pretty much everything I know about the different types of noise I learnt from Space-Time Quest. This is a lovely educational game developed by people here at the University of Birmingham. In the game, you have to design the best gravitational-wave detector that you can for a given budget. There’s a lot of science that goes into working out how sensitive the detector is. It takes a bit of practice to get into it (remember to switch on the laser first), but it’s very easy to get competitive. We often use the game as part of outreach workshops, and we’ve had some school groups get quite invested in the high-score tables. My tip is that going underground doesn’t seem to be worth the money. Of course, if you happen to be reviewing the proposal to build the Einstein Telescope, you should completely ignore that, and just concentrate how cool the digging machine looks. Space-Time Quest shows how difficult it can be optimising sensitivity. 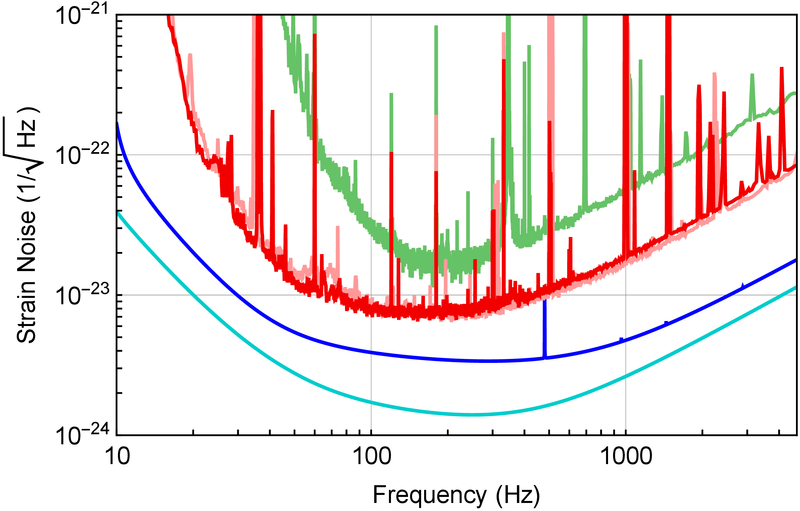 There are trade-offs between different types of noise, and these have been carefully studied. What Space-Time Quest doesn’t show, is just how much work it takes to engineer a detector. The fourth section is a massive shopping list of components needed to build Advanced LIGO. There are rather more options than in Space-Time Quest, but many are familiar, even if given less friendly names. If this section were the list of contents for some Ikea furniture, you would know that you’ve made a terrible life-choice; there’s no way you’re going to assemble this before Monday. Highlights include the 40 kg mirrors. I’m sure breaking one of those would incur more than seven years bad luck. For those of you playing along with Space-Time Quest at home, the mirrors are fused silica. Section 4.8.4 describes how to get the arms to lock, one of the key steps in commissioning the detectors. The section concludes with details of how to control such a complicated instrument, the key seems to be to have so many acronyms that there’s no space for any component to move in an unwanted way. 2015 3 months observing at a binary neutron star (BNS) range of 40–80 Mpc. 2016–2017 6 months observing at a BNS range of 80–120 Mpc. 2017–2018 9 months observing at a BNS range of 120–170 Mpc. 2019 Achieve full sensitivity of a BNS range of 200 Mpc. The BNS range is the distance at which a typical binary made up of two 1.4 solar mass neutrons stars could be detected when averaging over all orientations. If you have a perfectly aligned binary, you can detect it out to a further distance, the BNS horizon, which is about 2.26 times the BNS range. There are a couple of things to note from the plan. First, the initial observing run (O1 to the cool kids) is this year! The second is how much the range will extend before hitting design sensitivity. This should significantly increase the number of possible detections, as each doubling of the range corresponds to a volume change of a factor of eight. Coupling this with the increasing length of the observing runs should mean that the chance of a detection increases every year. It will be an exciting few years for Advanced LIGO. I’ve been a member of the LIGO Scientific Collaboration for just over a year now. It turns out that designing, building and operating a network of gravitational-wave detectors is rather tricky, maybe even harder than completing Super Mario Bros. 3, so it takes a lot of work. There are over 900 collaboration members, all working on different aspects of the project. Since so much of the research is inter-related, certain papers (such as those that use data from the instruments) written by collaboration members have to include the name of everyone who works (at least half the time) on LIGO-related things. After a year in the collaboration, I have now levelled up to be included in the full author list (if there was an initiation ritual, I’ve suppressed the memory). This is weird: papers appear with my name on that I’ve not actually done any work for. It seems sort of like having to bring cake into your office on your birthday: you do have to share your (delicious) cupcakes with everyone else, but in return you get cake even when your birthday is nowhere near. Perhaps all those motivational posters where right about the value of teamwork? I do feel a little guilty about all the extra trees that will die because of people printing out these papers. My New Year’s resolution was to write a post about every paper I have published. I am going to try to do the LIGO papers too. This should at least make sure that I actually read them all. There are official science summaries written by the people who did actually do the work, which may be better if you actually want an accurate explanation. My first collaboration paper is a joint publication of the LIGO and Virgo collaborations (even more sharing). Neutron stars are formed from the cores of dead stars. When a star’s nuclear fuel starts to run out, their core collapses. The most massive form black holes, the lightest (like our Sun) form white dwarfs, and the ones in the middle form neutron stars. These are really dense, they have about the same mass as our entire Sun (perhaps twice the Sun’s mass), but are just a few kilometres across. Pulsars are a type of neutron star, they emit a beam of radiation that sweeps across the sky as they rotate, sort of like a light-house. If one of these beams hits the Earth, we see a radio pulse. The pulses come regularly, so you can work out how fast the pulsar is spinning (and do some other cool things too). Because pulsars rotate really quickly, if they have a little bump on their surface, they can emit (potentially detectable) gravitational waves. This paper searches for these signals from the Crab and Vela pulsars. We know where these pulsars are, and how quickly they are rotating, so it’s possible to do a targeted search for gravitational waves (only checking the data for signals that are close to what we expect). Importantly, some wiggle room in the frequency is allowed just in case different parts of the pulsar slosh around at slightly different rates and so the gravitational-wave frequency doesn’t perfectly match what we’d expect from the frequency of pulses; the search is done in a narrow band of frequencies around the expected one. The data used is from Virgo’s fourth science run (VSR4). That was taken back in 2011 (around the time that Captain America was released). The search technique is new (Astone et al., 2014), it’s the first one that incorporates this searching in a narrow band of frequencies; I think the point was to test their search technique on real data before the advanced detectors start producing new data. Composite image of Hubble (red) optical observations and Chandra (blue) X-ray observations of the Crab pulsar. 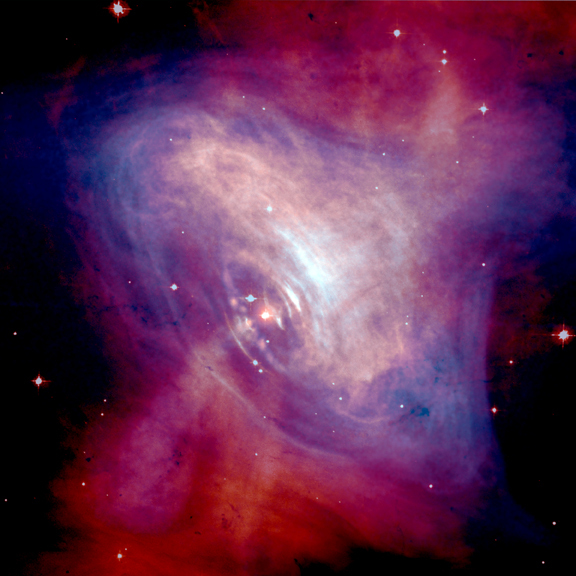 The pulsar has a mass of 1.4 solar masses and rotates every 30 ms. Credit: Hester et al. The pulsars emit gravitational waves continuously, they just keep humming as they rotate. The frequency will slow gradually as the pulsar loses energy. As the Earth rotates, the humming gets louder and quieter because the sensitivity of gravitational-wave detectors depends upon where the source is in the sky. Putting this all together gives you a good template for what the signal should look like, and you can see how well it fits the data. It’s kind of like trying to find the right jigsaw piece by searching for the one that interlocks best with those around it. Of course, there is a lot of noise in our detectors, so it’s like if the jigsaw was actually made out of jelly: you could get many pieces to fit if you squeeze them the right way, but then people wouldn’t believe that you’ve actually found the right one. Some detection statistics (which I don’t particularly like, but probably give a sensible answer) are used to quantify how likely it is that they’ve found a piece that fits (that there is a signal). The whole pipeline is tested by analysing some injected signals (artificial signals made to see if things work made both by adding signals digitally to the data and by actually jiggling the mirrors of the interferometer). It seems to do OK here. Turning to the actual data, they very carefully show that they don’t think they’ve detected anything for either Vela or Crab. Of course, all the cool kids don’t detect gravitational waves, so that’s not too surprising. This paper doesn’t claim a detection of gravitational waves, but it doesn’t stink like Zoidberg. Having not detected anything, you can place an upper limit of the amplitude of any waves that are emitted (because if they were larger, you would’ve detected them). This amplitude can then be compared with what’s expected from the spin-down limit: the amplitude that would be required to explain the slowing of the pulsar. We know how the pulsars are slowing, but not why; it could be because of energy being lost to magnetic fields (the energy for the beams has to come from somewhere), it could be through energy lost as gravitational waves, it could be because of some internal damping, it could all be gnomes. The spin-down limit assumes that it’s all because of gravitational waves, you couldn’t have bigger amplitude waves than this unless something else (that would have to be gnomes) was pumping energy into the pulsar to keep it spinning. The upper limit for the Vela pulsar is about the same as the spin-down limit, so we’ve not learnt anything new. For the Crab pulsar, the upper limit is about half the spin-down limit, which is something, but not really exciting. Hopefully, doing the same sort of searches with data from the advanced detectors will be more interesting. It’s probably less fun that eating a jigsaw-shaped jelly, but it might be more useful in the future.